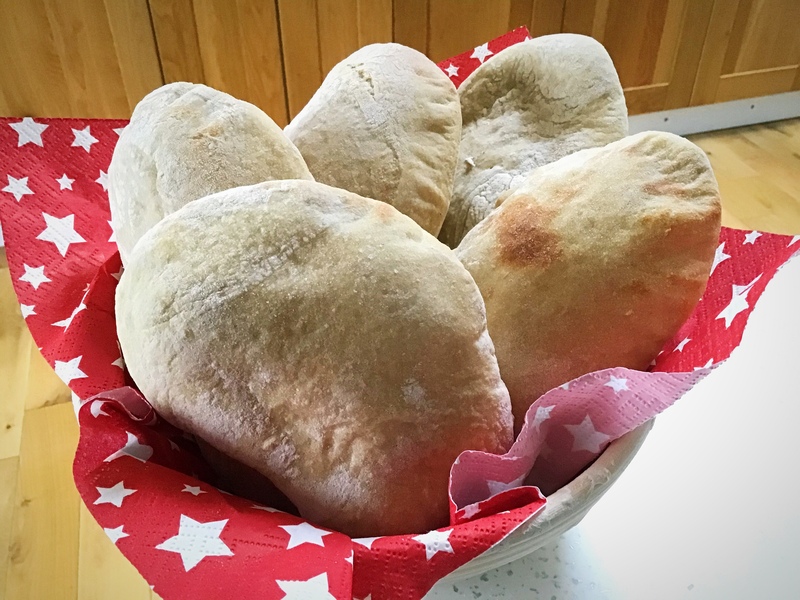 The rolls are made using my master recipe dough again, but this time direct from the banneton, maybe my simplest method for making rolls yet! 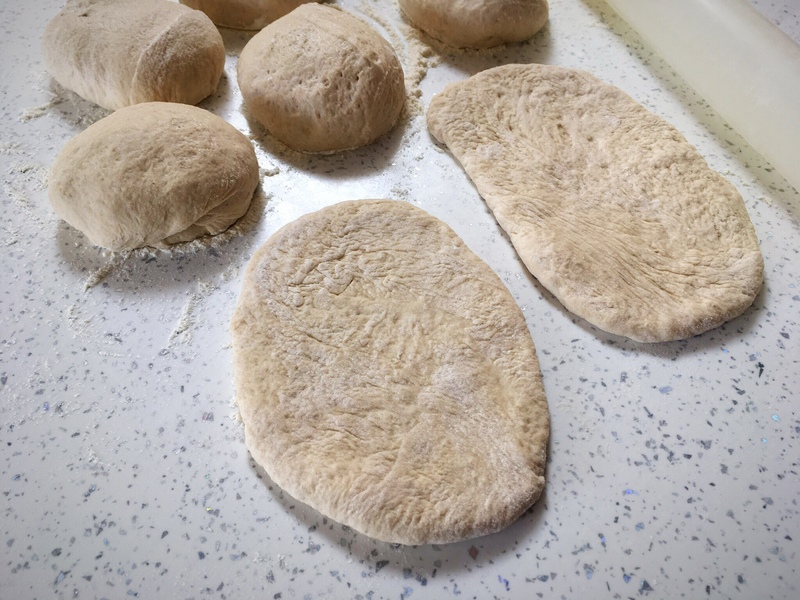 Following the overnight prove, bring the dough gently together and place it into a well rice floured banneton, cover, and place it in the fridge as per the recipe process. 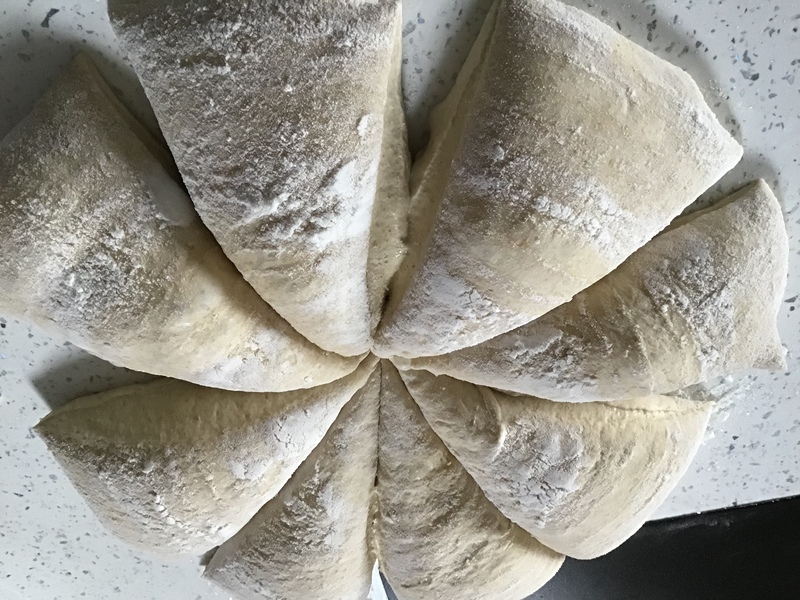 You can then use this whenever you are ready to make the rolls; I have used dough that’s been in the fridge for 3 hours and up to 31 hours and everything in between to make these rolls. 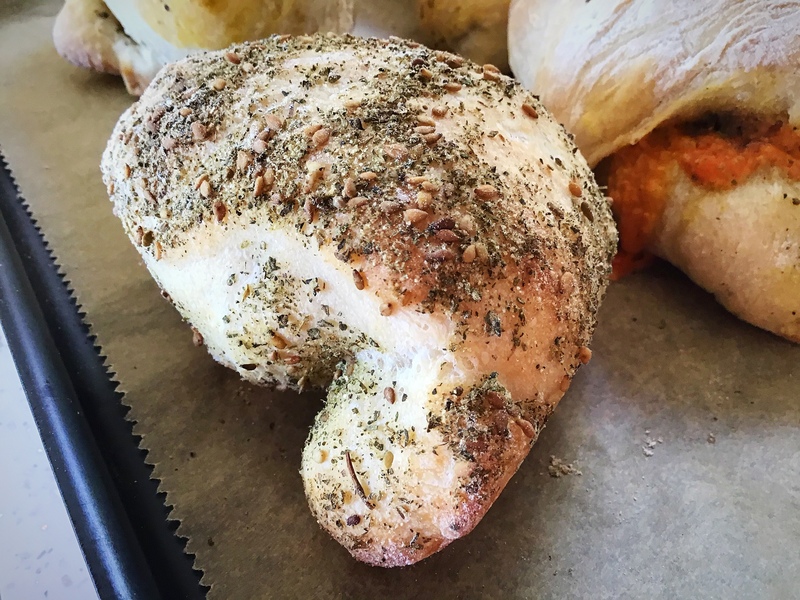 The point being that you can have the dough ready to use whenever you need it. 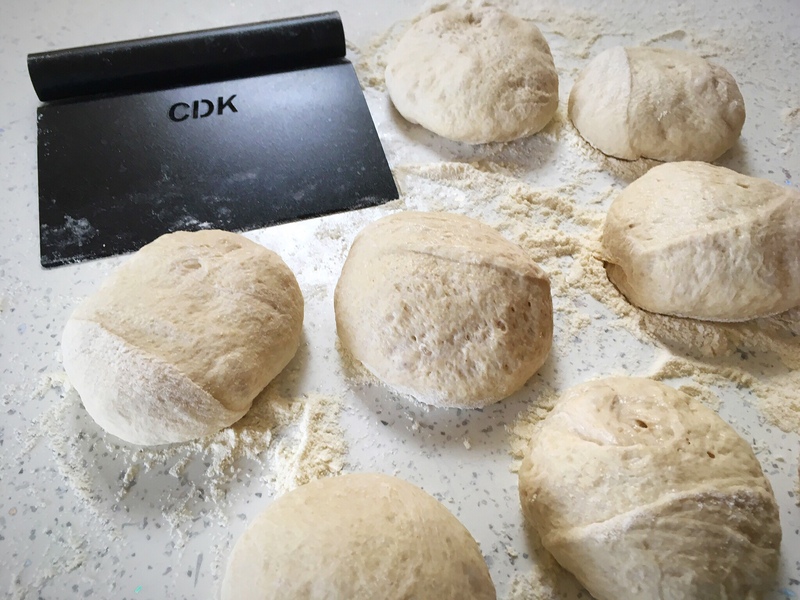 It gives you full control over the timing – you don’t need to held hostage by the dough! When you’re ready, sprinkle some water onto your counter surface. Turn the dome of dough gently out onto the counter. 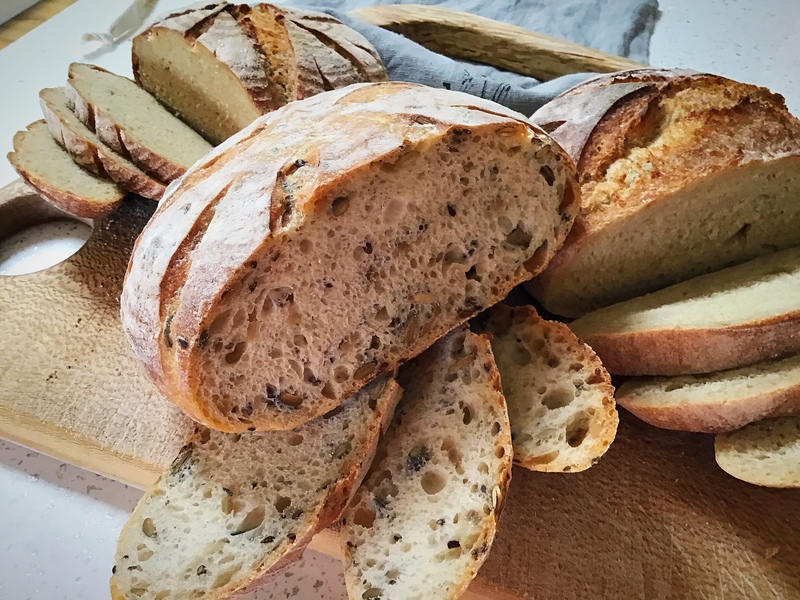 Using a dough cutter, cut into 8 or 12 wedges. 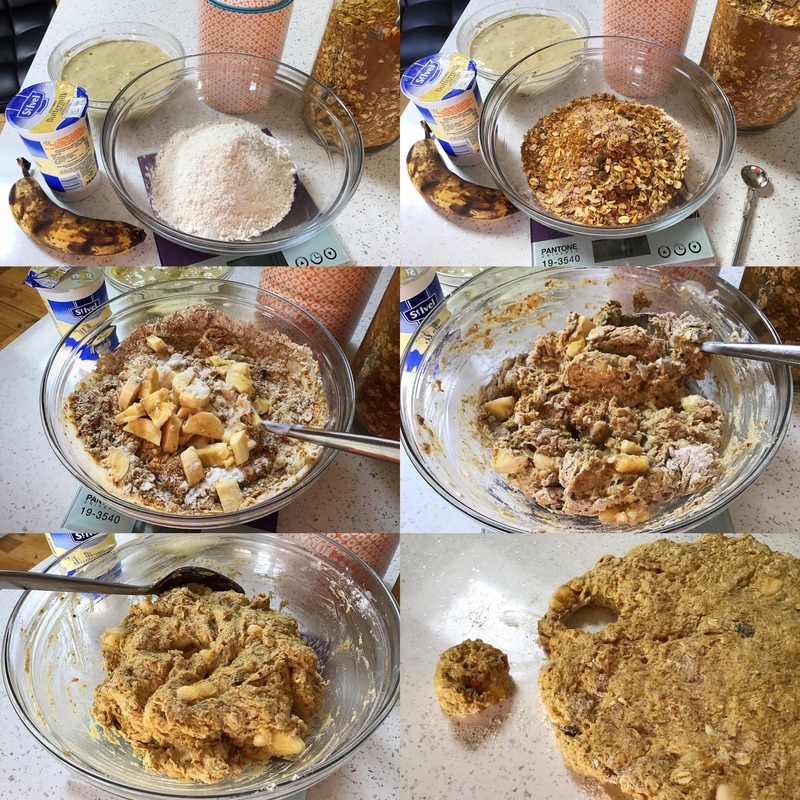 *At this point you can gently place the pieces of dough into chopped nuts, seeds, oats (as baked below), whatever you like. 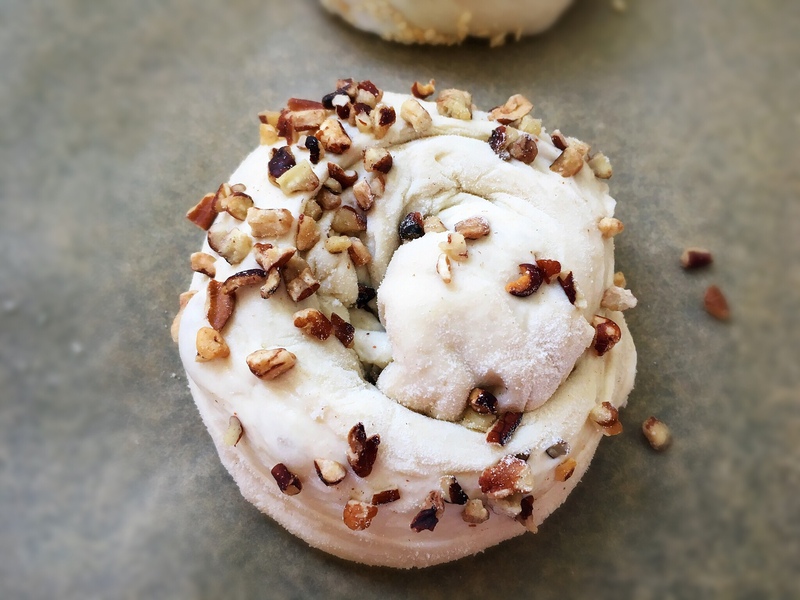 You can try and keep the wedge shape or wind them into other shapes, or just splodge them on the tray (see the photos below of a chopped pecan studded roll made by placing the cut wedge into the chopped nuts then wound into a swirl). Place the wedges onto a prepared tray. 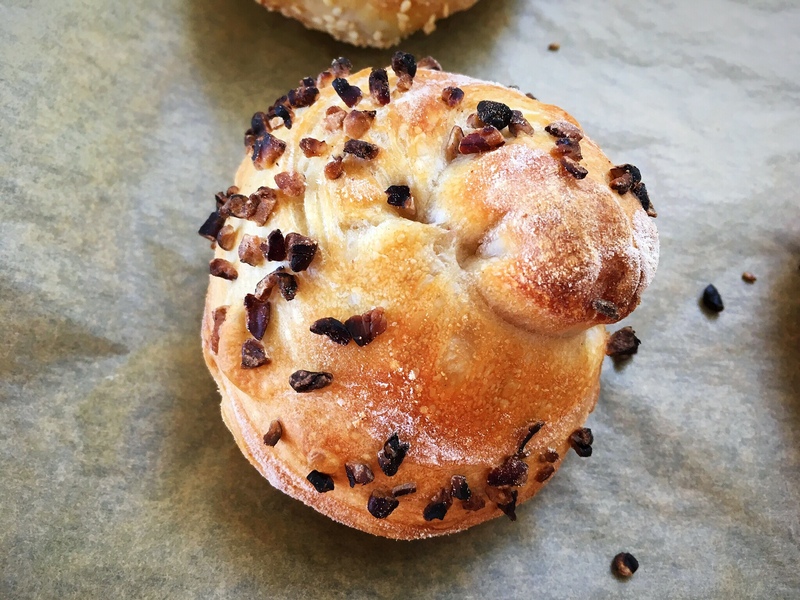 You can now bake these from cold start, or in a preheated oven. They don’t need to be covered and no steam is required. 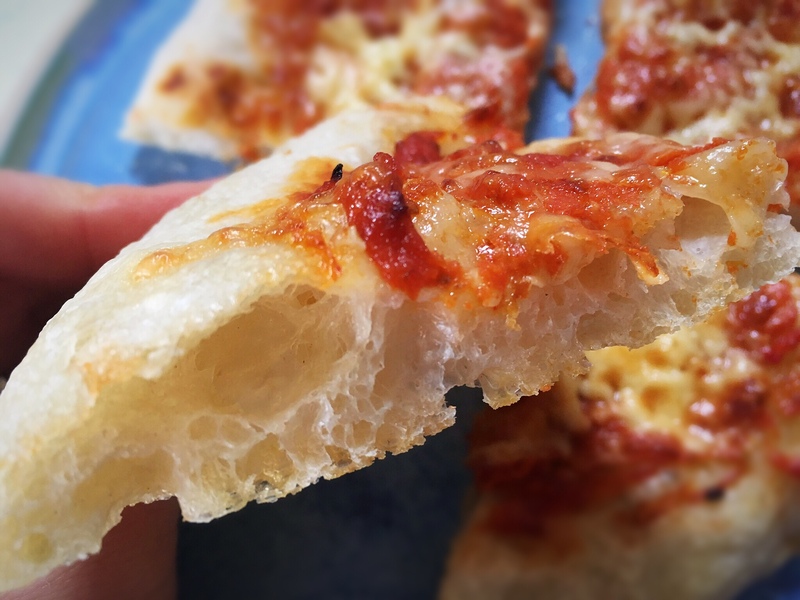 The outcome being a lovely textured, holey, tasty pizza base! 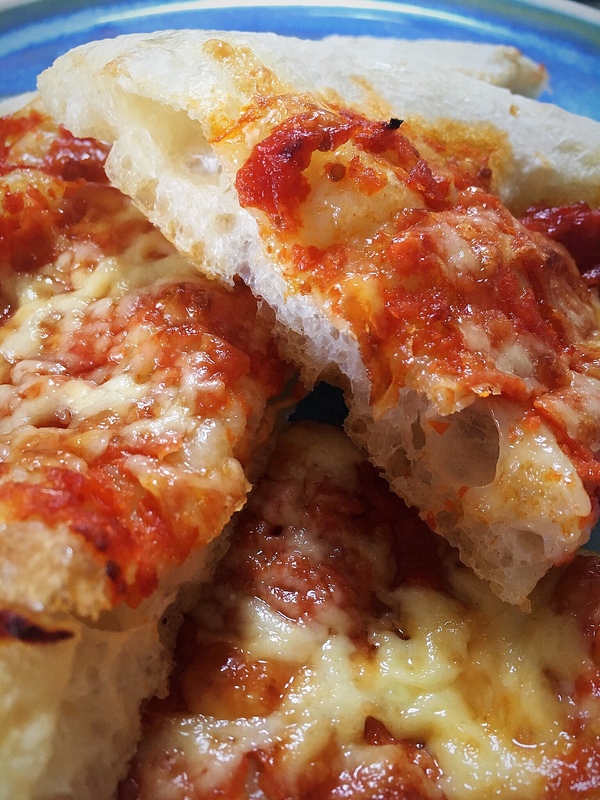 The key is how to manage and store the overnight dough ready for when you want your pizzas. 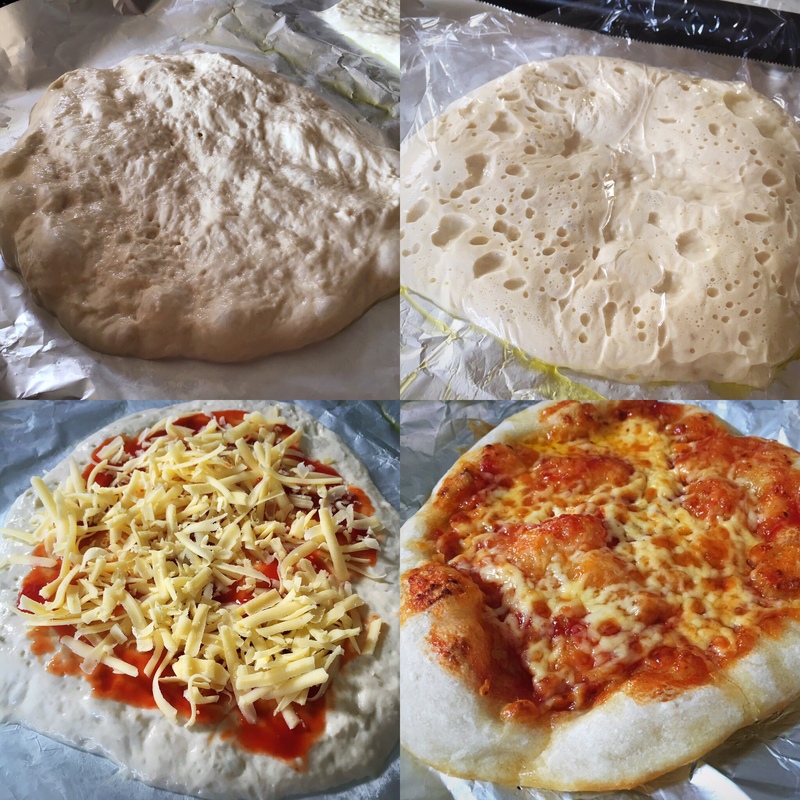 I have got 2 methods below, each designed to make it simple to fit the dough in with your timings, and not the other way round! 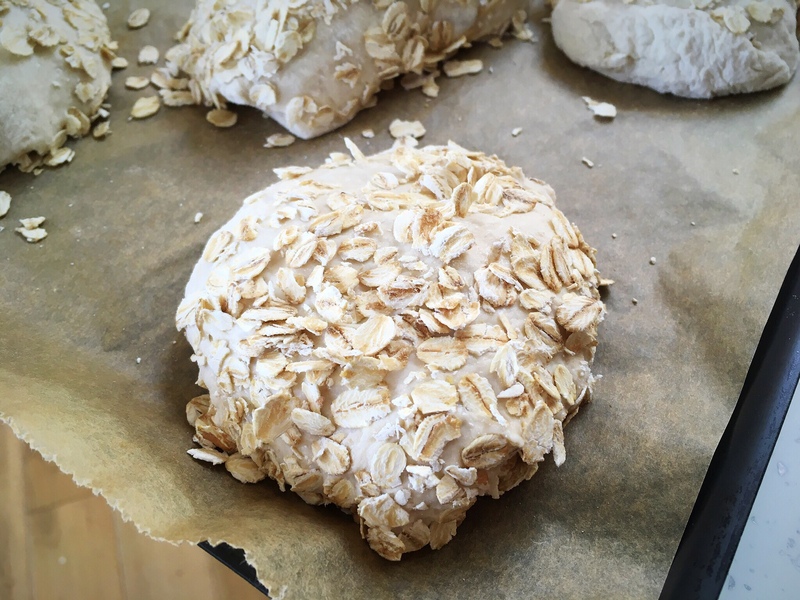 The morning after the overnight prove, you will hopefully have a lovely big bowl of bubbly dough; if it is escaping the bowl, gently do a single set of pulls and folds, just go once round the bowl, to pull it loosely together, re-cover it, and place it in the fridge. If the dough hasn’t reached the top of the bowl already, just place it in the fridge to bring the activity to a halt until you want to use it. When you know when you want your pizzas to be ready for, remove the dough from the fridge an hour or so beforehand and let it warm up a bit. Cover your work surface with water, flour or olive oil, I use water. 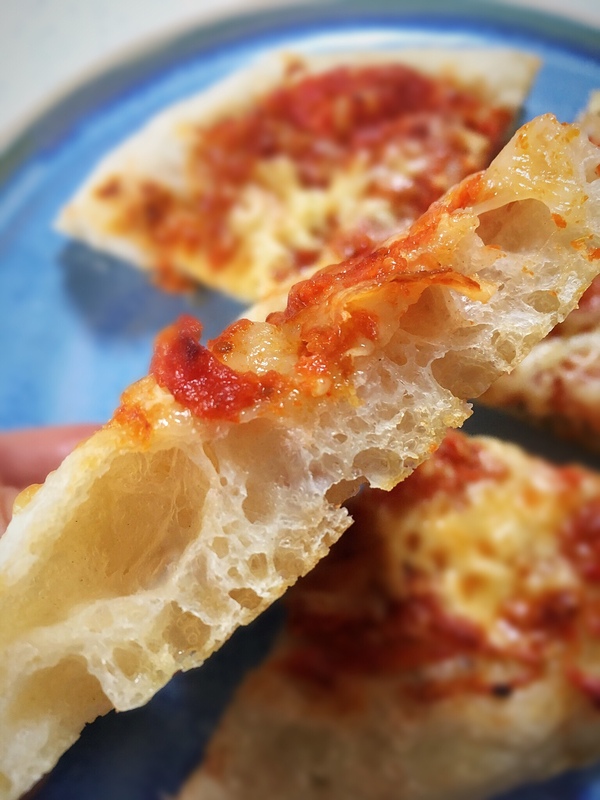 Turn the dough out from the bowl onto your surface and cut into portions, 2, 4 or 6, depending how big you would like your pizzas to be. 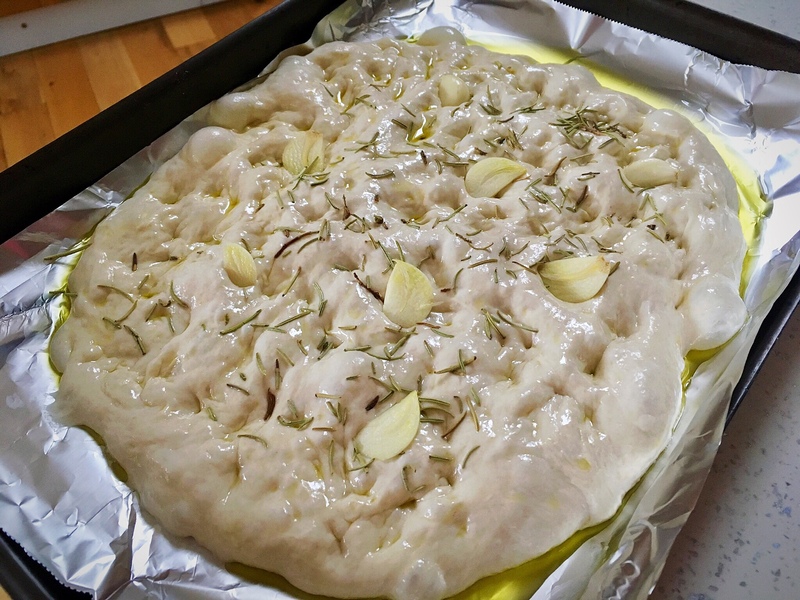 **I use a foil lined baking tray to cook my pizzas, liberally drizzled with olive oil (I like the crust it generates when baked). 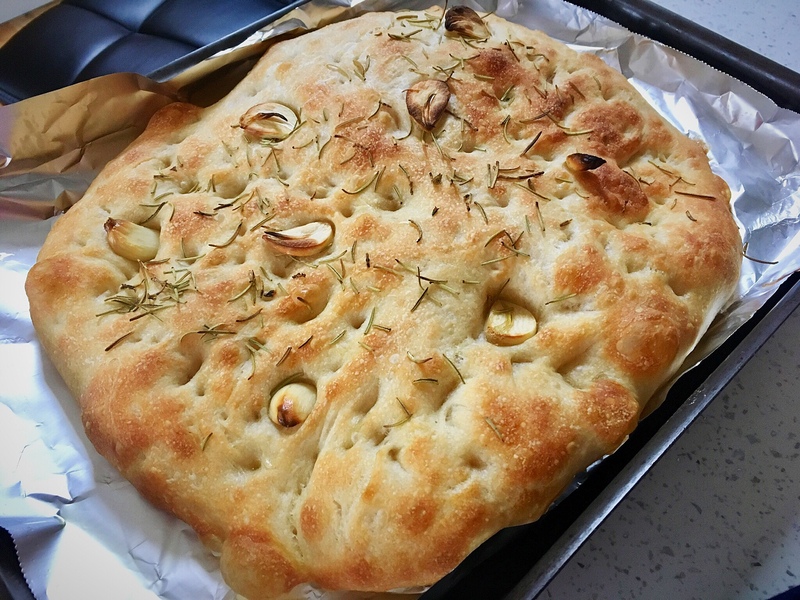 However, you may prefer using semolina, polenta/corn meal, flour, whatever your choice under the dough, directly onto your baking tray or baking implement of your choice. If you’re using a pizza stone, prepare the dough on a board or tray ready to be able to move it across to your stone as you usually do. 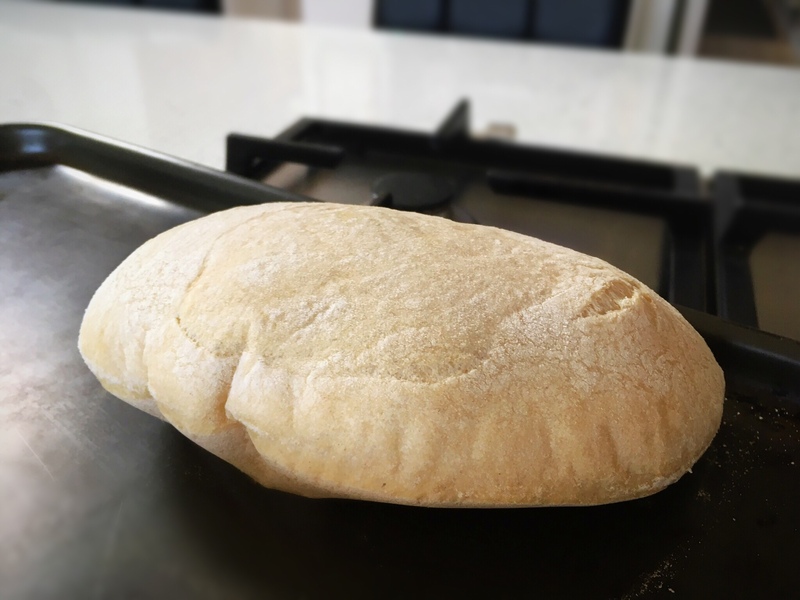 After 10 minutes place the dough on your chosen bakeware, and start to gently use your finger tips to push the dough out into a thinner rounder shape, or shape of your choice. You will need to let it sit for a few minutes and then do it again as the dough will bounce back. Preheat the oven to 220C fan/240 non fan/460F. 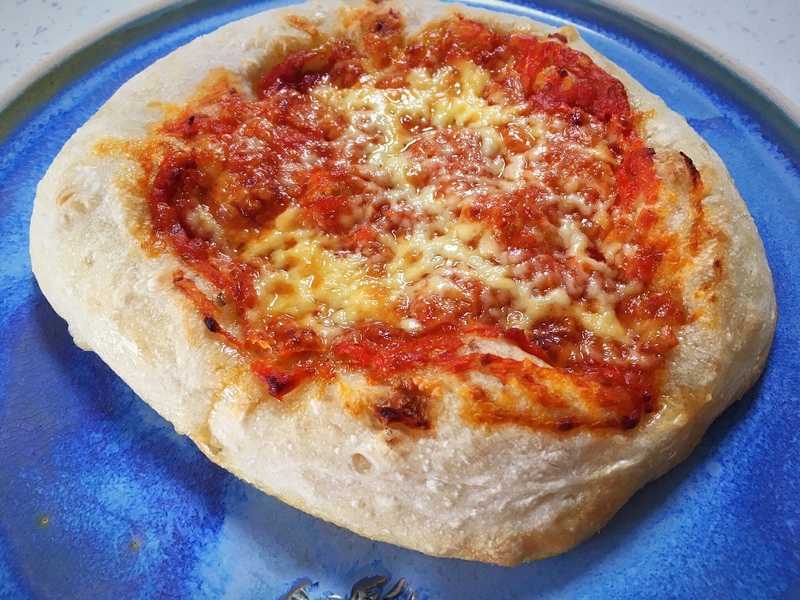 Give your dough one final push out, spread with sauce of your choice and toppings of your choice, and bake for 12-15 minutes until the base is cooked and the cheese is bubbling. In the morning you will hopefully have a lovely big bowl of dough. Cover your work surface in flour, water or oil, and turn the dough out onto the surface. I use water at this point. Prepare your baking tray, I drizzle olive oil over my foil lined tray as stated above. 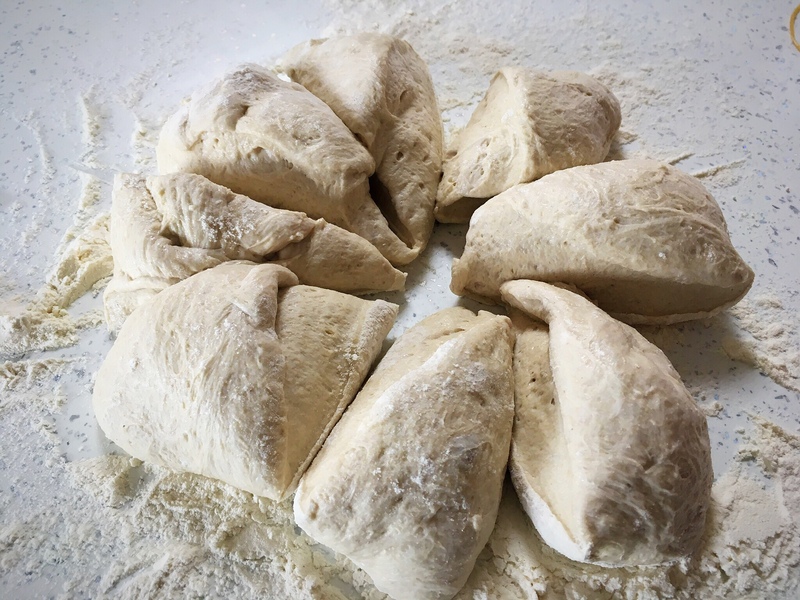 Portion the dough into 2, 4 or 6 pieces. 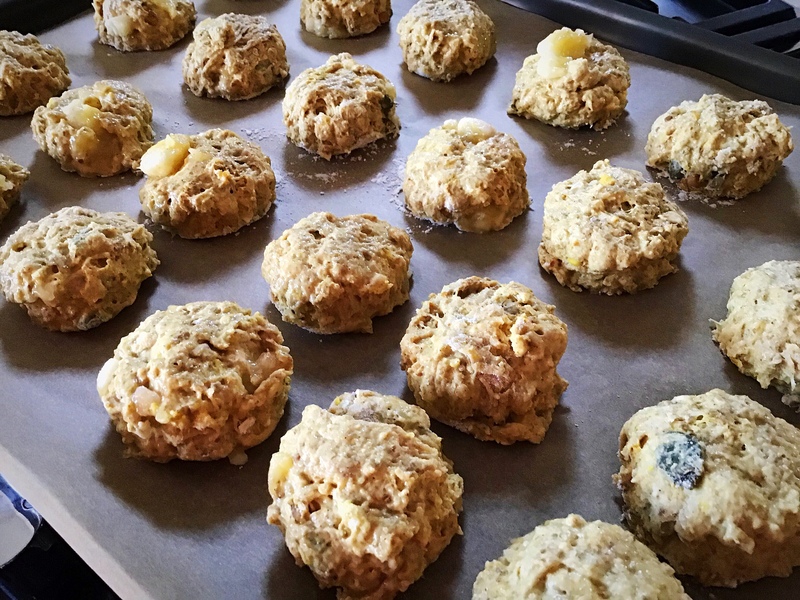 Place the pieces onto your prepared baking tray and use your fingers tips to push it gently out into a round; it will want to bounce back so let it set for a while and do it again. 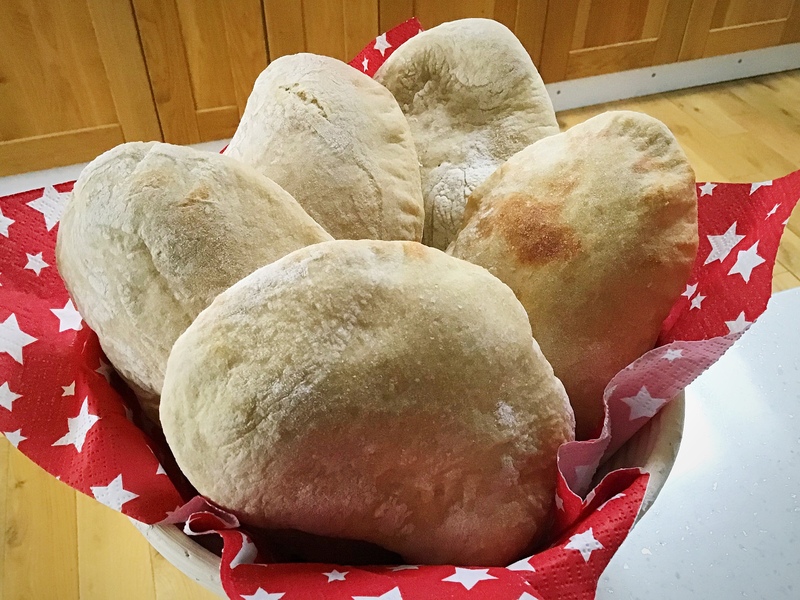 Once you’ve got it pushed out to the thinness and size that you want, cover the whole tray with a large plastic bag, or place cling film over the dough, and put the whole tray in the fridge. It can now sit in there until you want to use it, I’ve let mine sit in the fridge all day in the past. 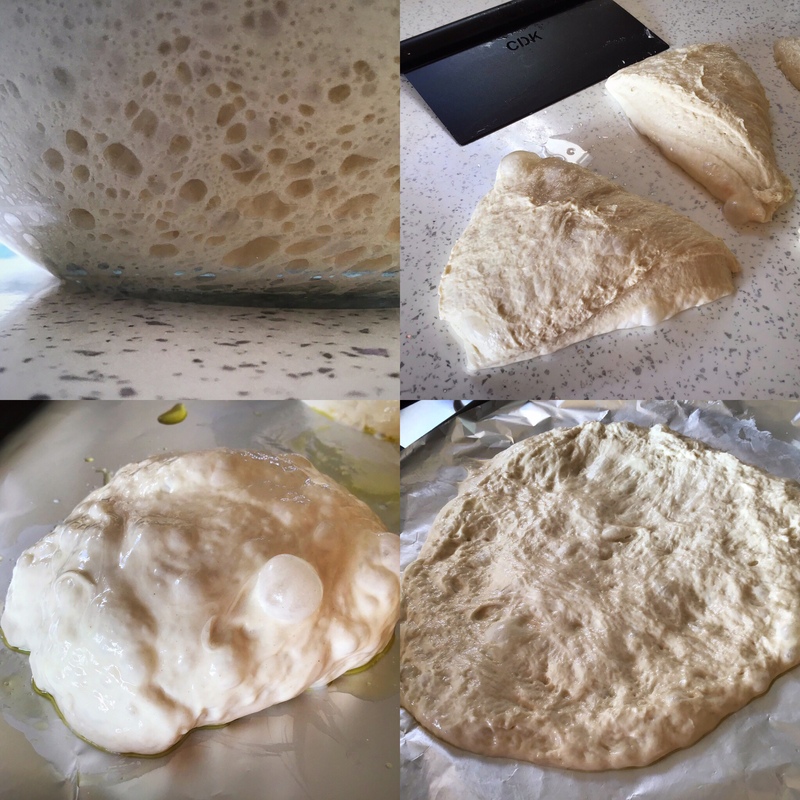 **The top 2 photos in the collage below show the dough before and after being in the fridge. As you can see, the dough continued to work in the cold – my SuperStar in action! 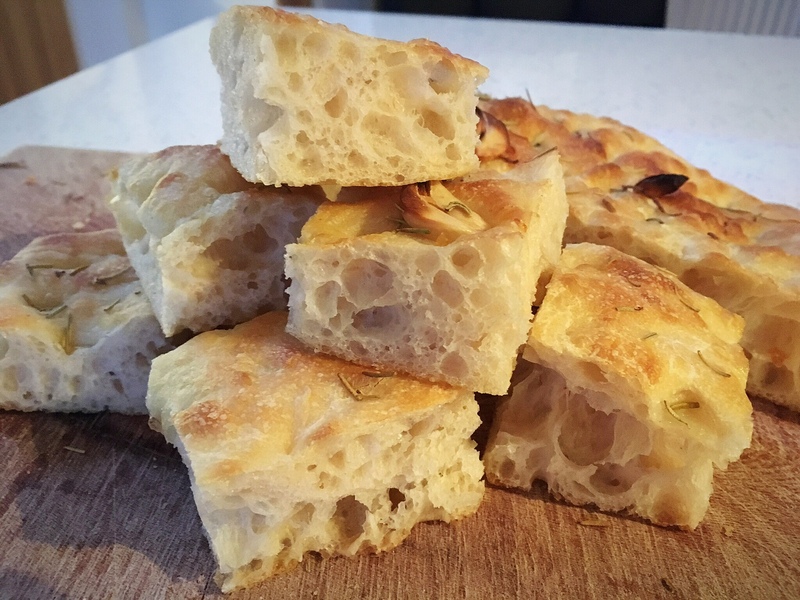 You can now use this dough directly from the fridge, you don’t need to let it warm up or come to room temperature, you can just add your toppings and bake. If you’re more comfortable letting it come to room temperature before baking you can do that too. 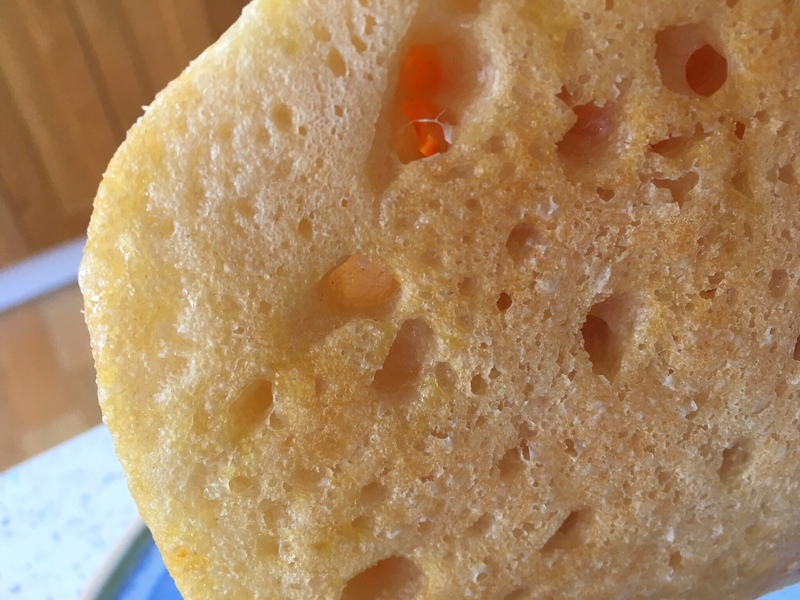 Preheat the oven to 220C fan/240 non fan/460F, and bake for 12-15 minutes until the base is cooked and the cheese is bubbling. 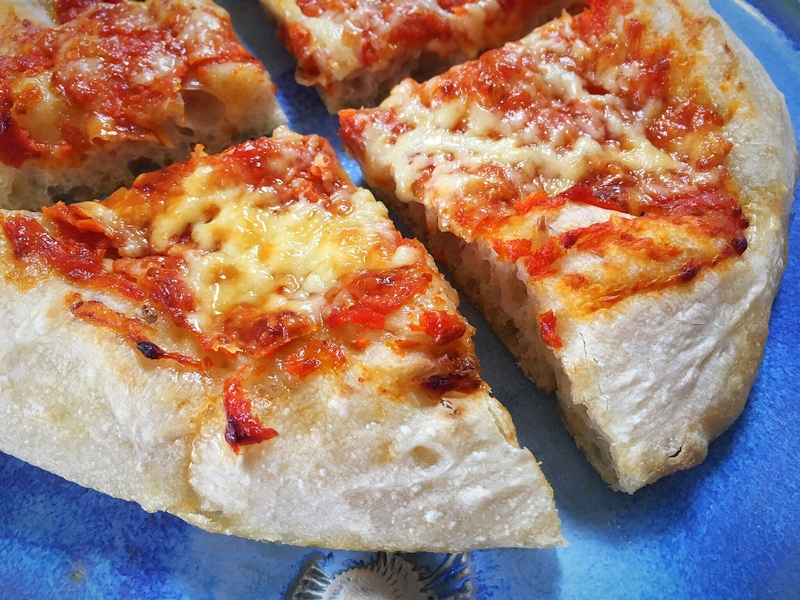 Beautiful blistered base, and it tastes SOOOO good! 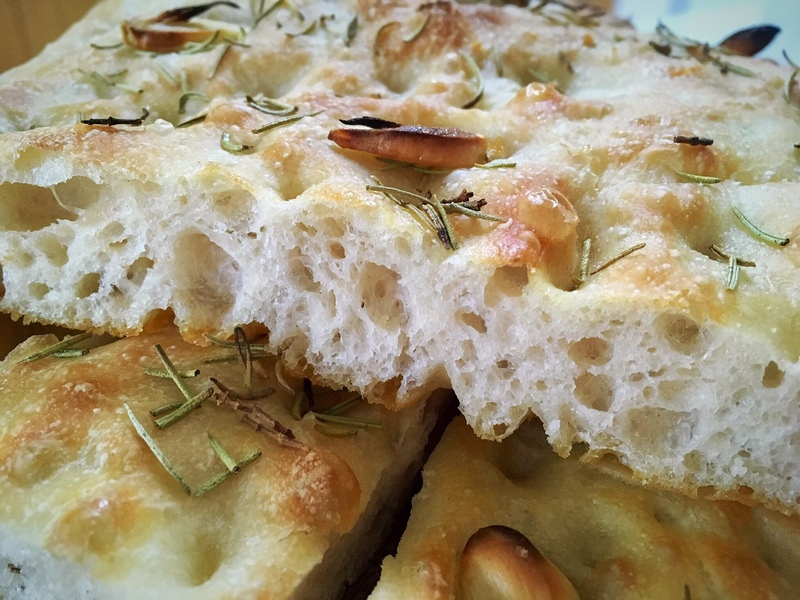 I love the crust that the olive oil creates, added to the soft interior. 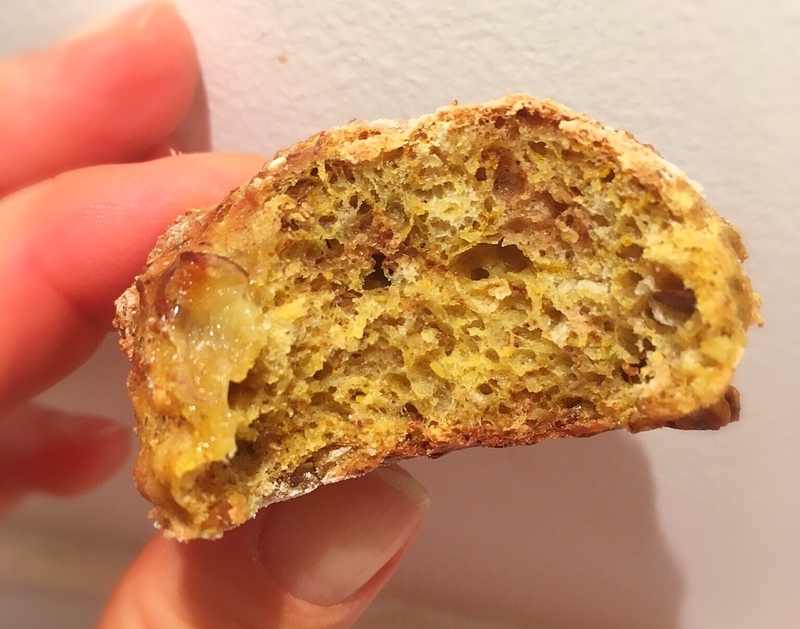 These little morsels were an amalgamation of some sourdough of my previous creations mixed up with an idea of recreating banana bread in some way. 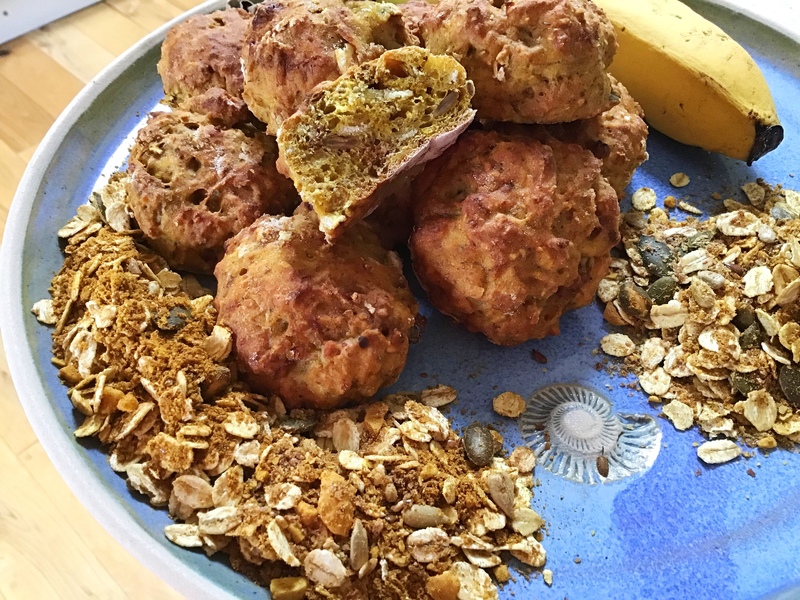 They are based on my sourdough buttermilk biscuits/scones and my breakfast mix loaf, so they include a portion of my daily breakfast mix, which includes oats, milled flaxseeds, chopped nuts, roasted seeds & my chai based spice mix, plus the addition of a chopped banana. 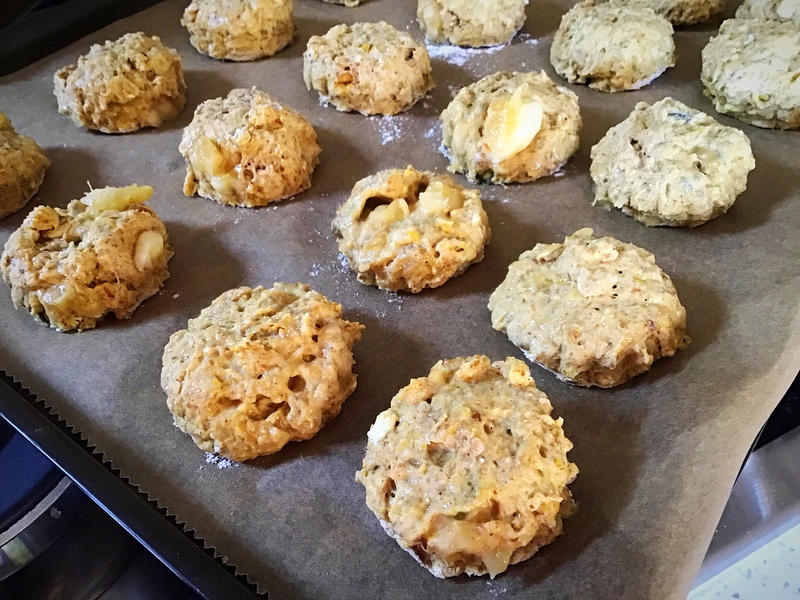 The smell as they were baking was amazing due to the spices, more details below, and although they were good straight from the oven, they actually got better as they cooled down and the flavour developed more. The next morning when I opened the lid of the pot I had stored them in, the aroma was gorgeous! 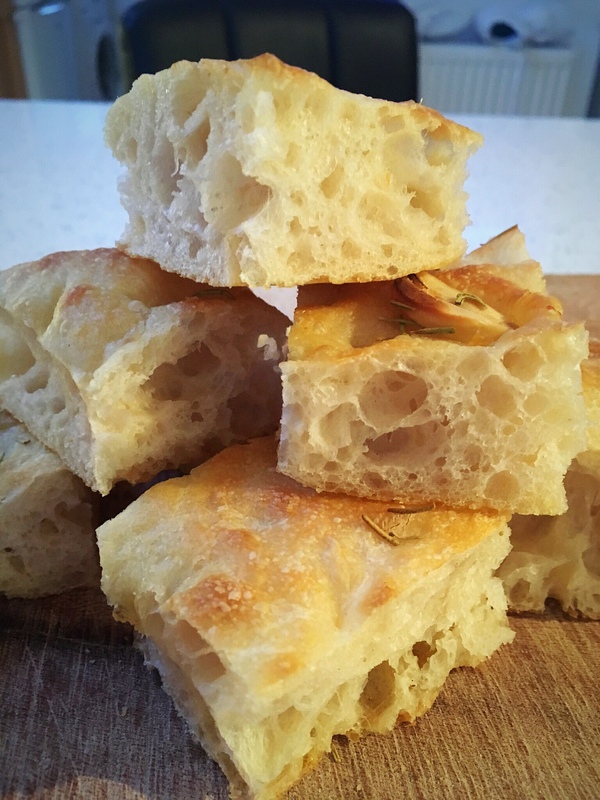 The use of the sourdough starter in the mix brings the typical texture you would expect, a perfect chewiness. 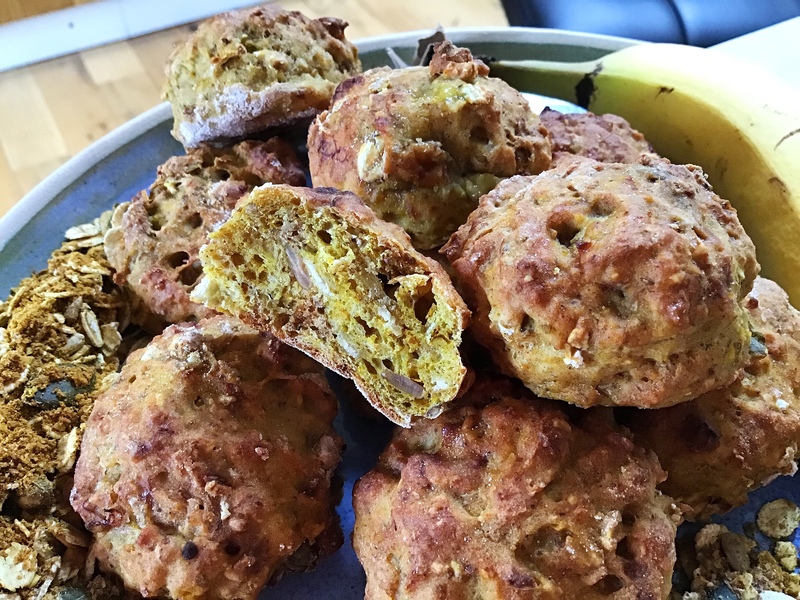 The breakfast mix adds more texture and the banana throws in some soft sweetness. 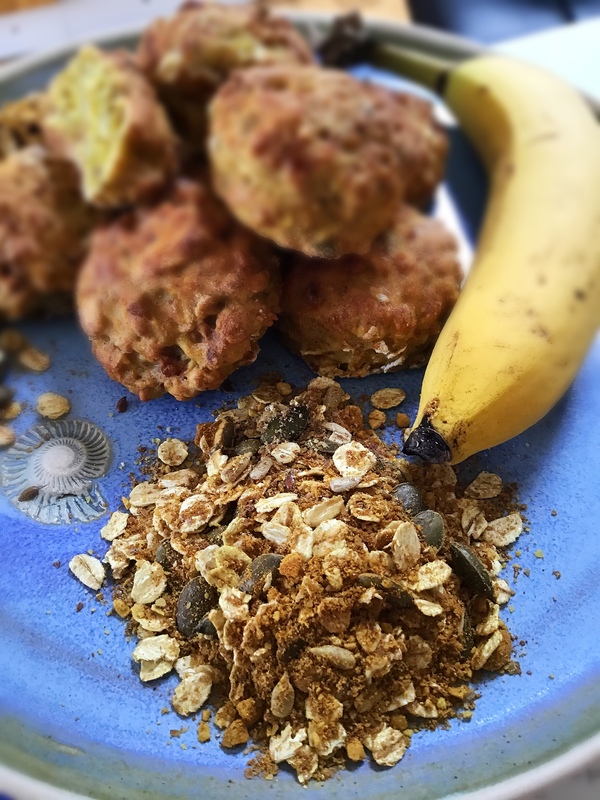 I don’t eat sweet things and I don’t add sugar to anything, so I didn’t include any form of sweetener in this recipe other than the banana which was enough for me; feel free to add whatever you need to to make the flavour what you want it to be. Thick cut oats, roasted pumpkin seeds, sunflower seeds & linseeds, chopped nuts of your choice, milled flaxseeds and my spice mix of ground cinnamon, ginger, turmeric, nutmeg, cardamom, cloves and black pepper. Mix everything together in a large bowl, don’t over mix. As I said above, they taste good immediately, but even better later in the day. And still good the next day in my opinion! How good does that look?? Well, I can tell you, it tasted as good as it looks!! 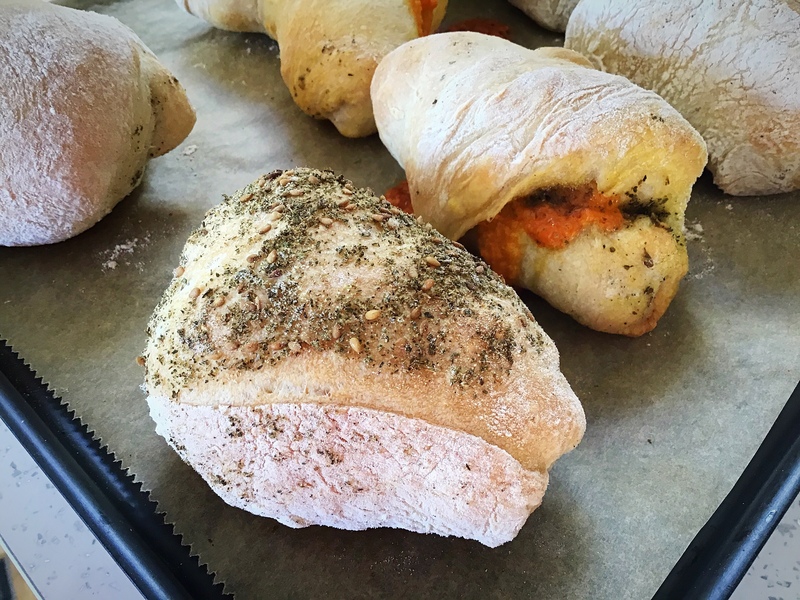 This is a cheese and zaatar filled sourdough roll. And it was SOOOOOO tasty! 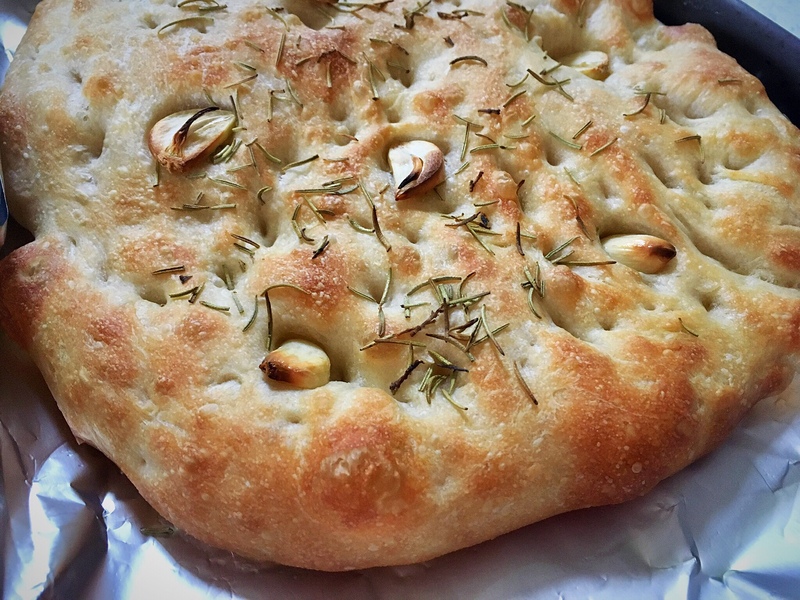 This one was made with just the addition of zaatar….equally tasty! 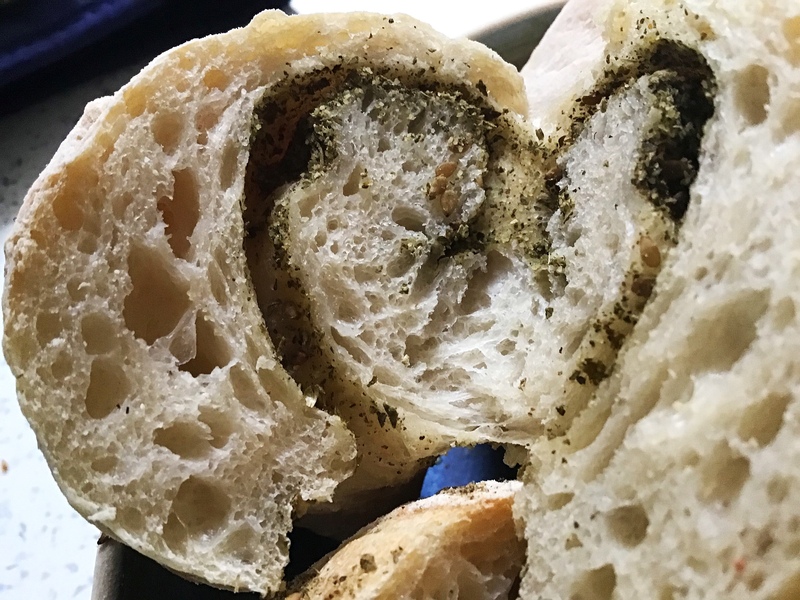 If zaatar is new to you, it’s an aromatic spice blend combining toasted sesame seeds, dried thyme, sometimes dried marjoram, and sumac. It tastes and smells amazing! Typically it is mixed with olive oil and placed at the table to dip bread into. 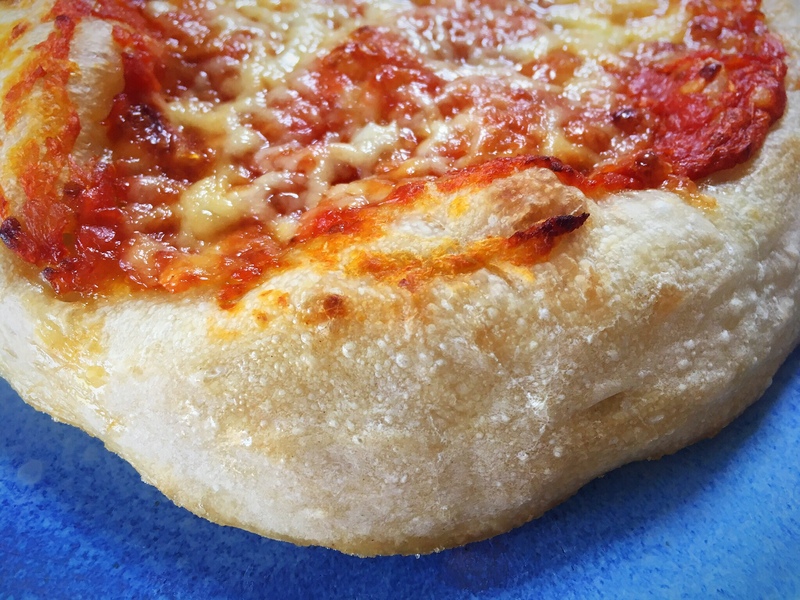 Other uses are to top breads and cook them like little pizzas, or sprinkle it over salads or roasted vegetables. 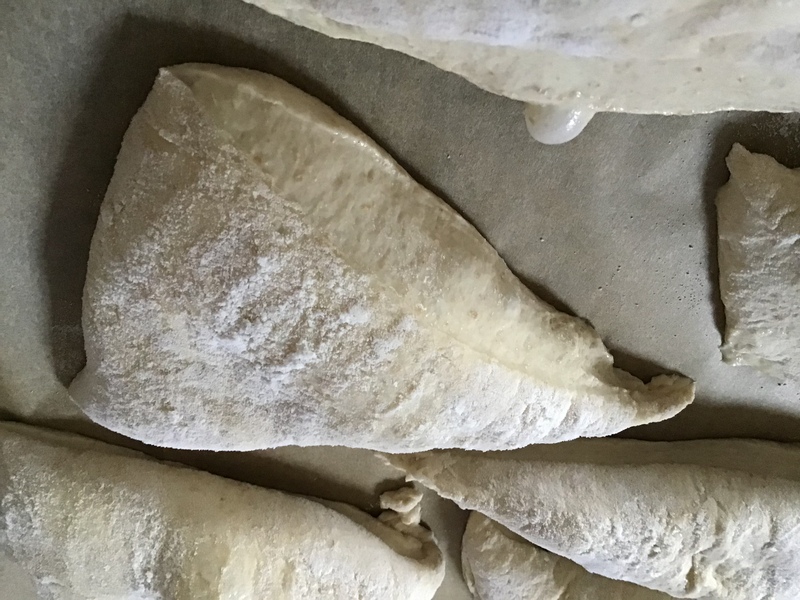 I had made some dough using my master recipe and process and it had proved overnight and I wanted to play with it and try some different shaping and filling, so this was one of the outcomes. 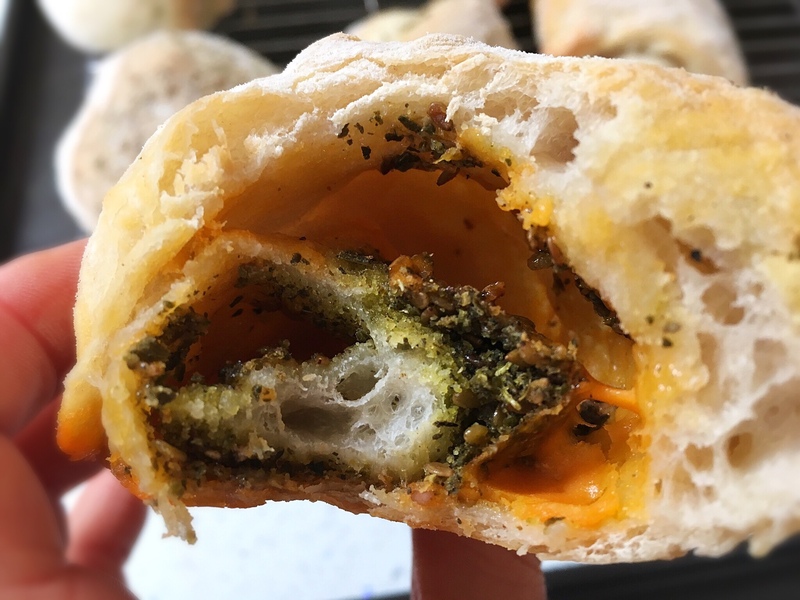 I filled some with cheese, I used Red Leicester cheese, I filled some with just zaatar and some with both, and I rolled others in the spice mix. I also played around with the shapes, rolling some like croissants, some like Swiss rolls, some as blobs! 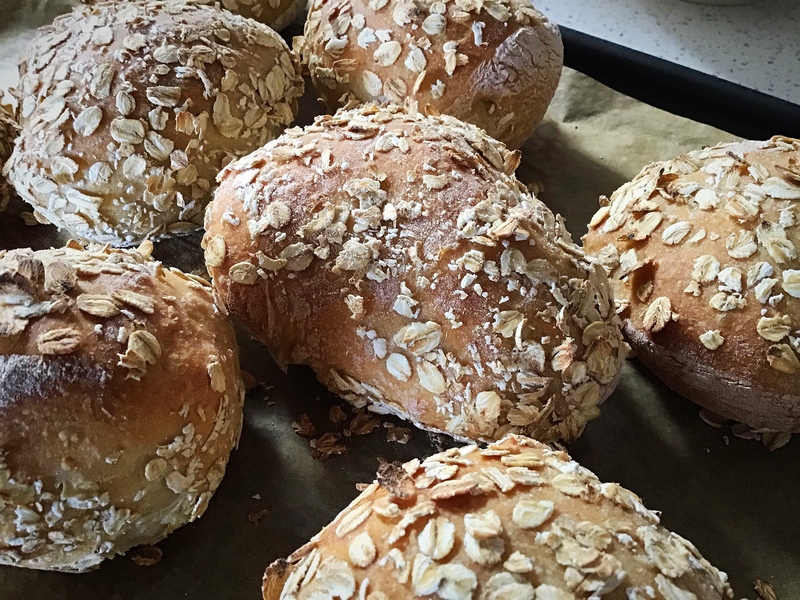 I then baked them from cold just as I would my sourdough rolls for 25 mins. 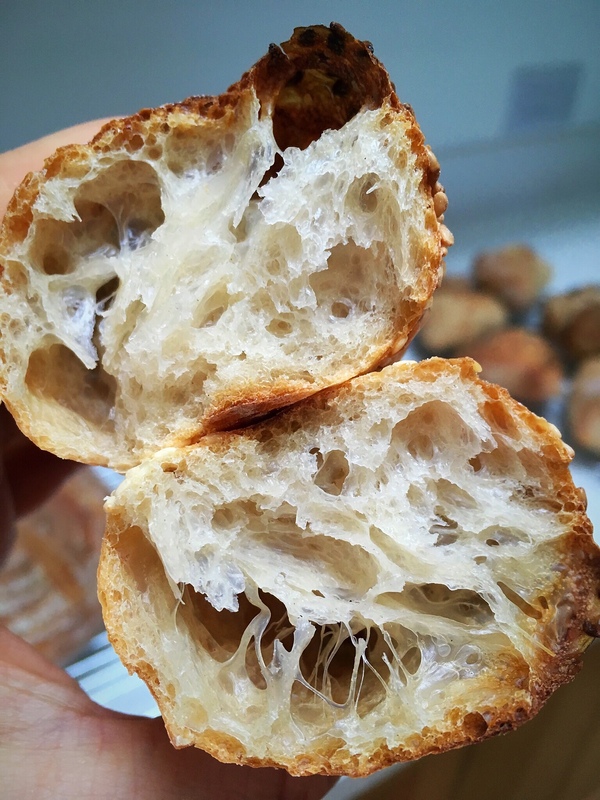 So if you fancy playing around with your dough and creating new shapes and fillings, let this be your inspiration! 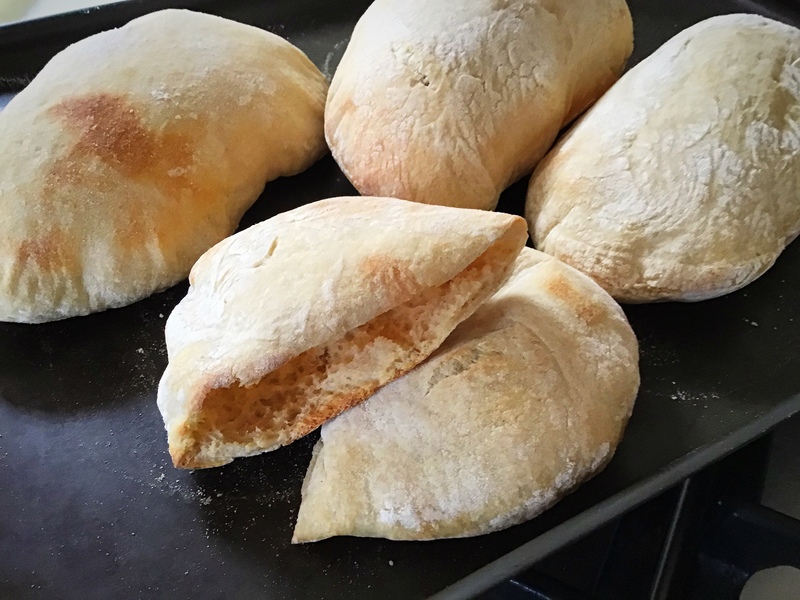 As I have with other recipes, I’ve used my master recipe and process to make these. 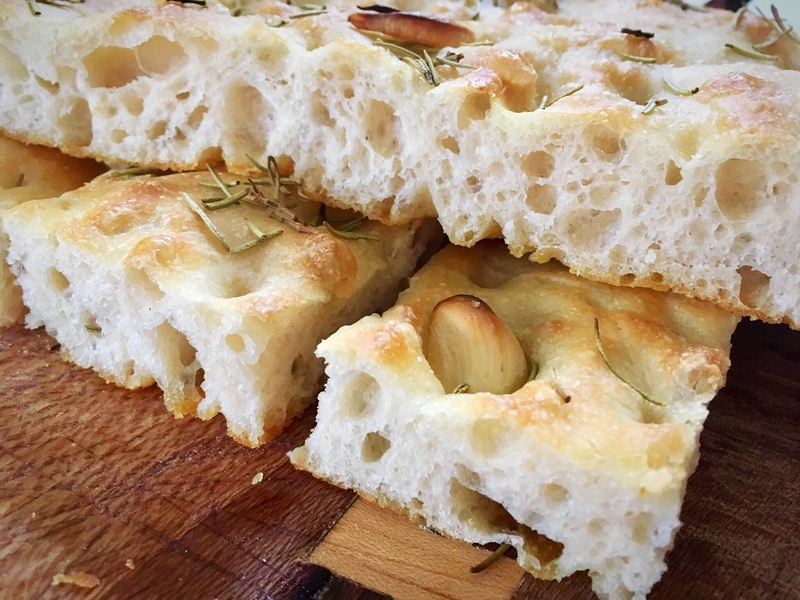 I’ve used 100% strong white bread flour in the dough, and on other occasions I’ve used a mix of strong white bread flour and spelt, and a version with kamut flour; basically, whatever dough you choose to put together (there’s more suggestions in this recipe collection), you can convert it to making rolls, focaccia, pizza dough, or now these pittas. 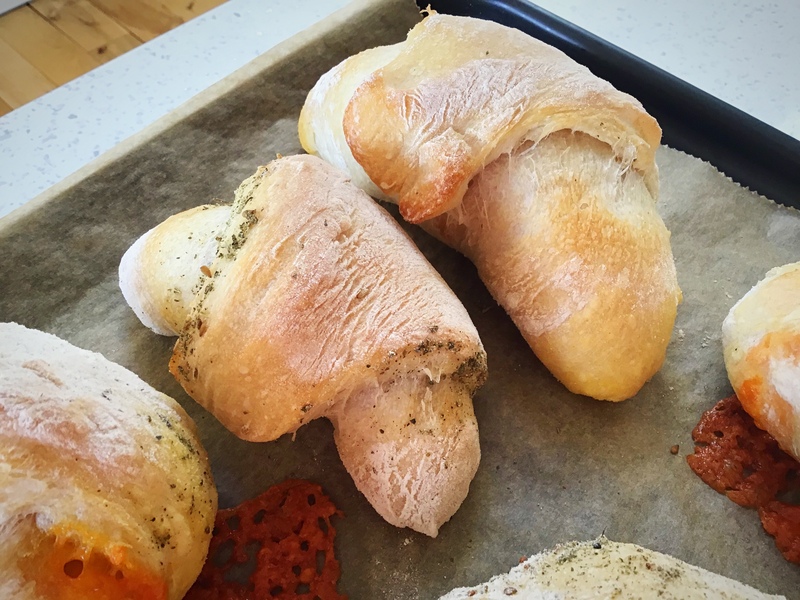 Follow my master recipe process up to and including the overnight prove, and then use that dough to create these bread pockets. Preheat your oven to 250C and place a tray in the oven to heat up. 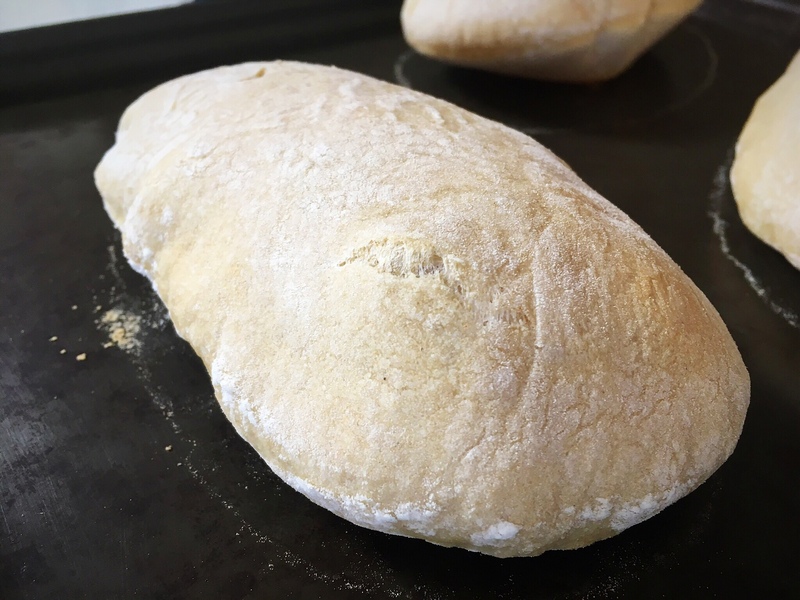 Take your overnight proved dough, gently pull it into a loose ball to enable you to turn it out onto a floured surface. 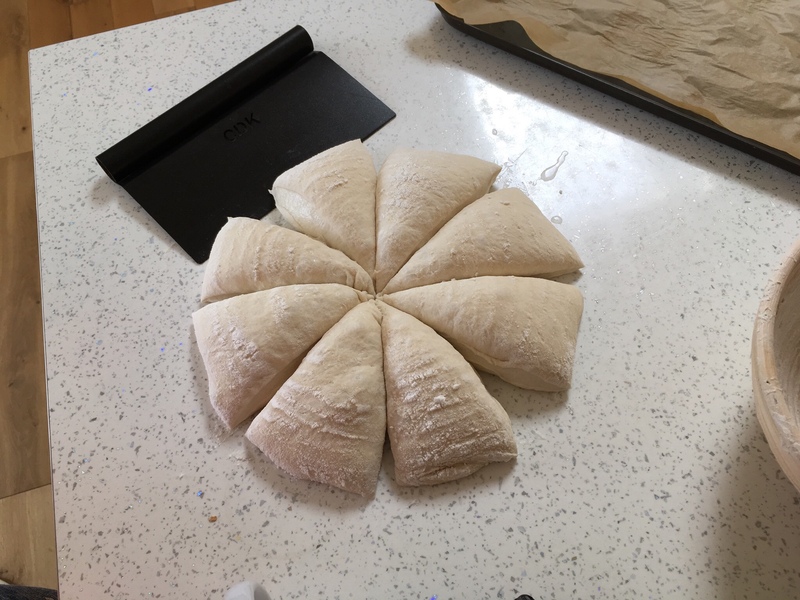 Using a dough knife, cut the dough into 8 pieces, as equal as you can by eye. Very gently shape each piece into a ball. Using a rolling pin, roll each ball into a larger flat circle or an oval 2-3mm thick. When the oven is ready, quickly remove the tray from the oven (to maintain the heat in the oven as much as possible), quickly place (or throw!) 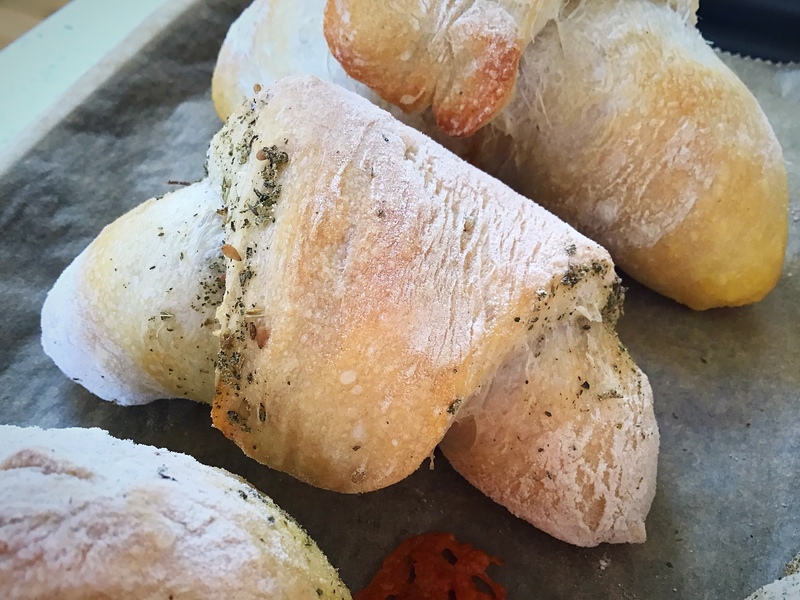 the rolled pieces of dough onto the tray, place it back into the oven and bake for 5-6 mins maximum. **Depending on how many you are baking and how big your tray is, you may need to bake these in a couple of batches. If that is the case, roll one set, bake them, then roll the next set and bake them, rather than rolling them all at once and have some of them sitting on the counter for too long. You should see them puff up during the bake. 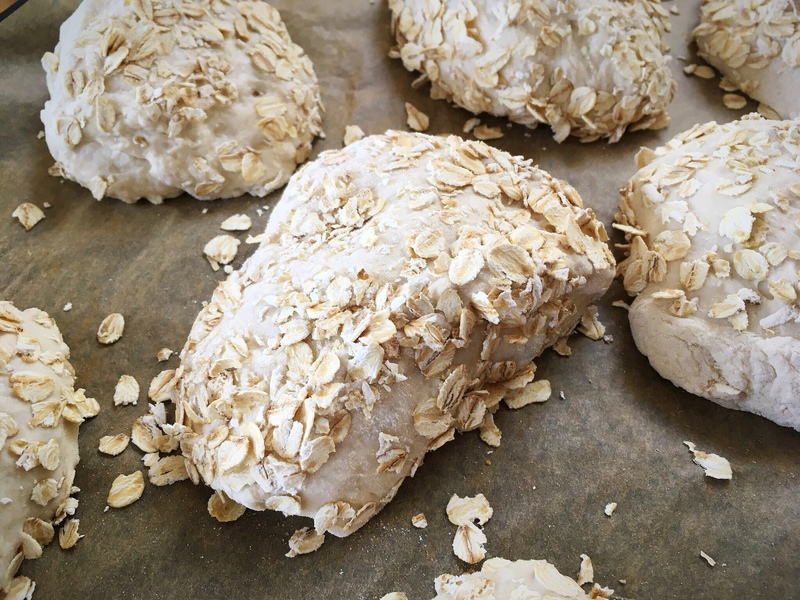 Remove from the tray from the oven and place the breads onto a rack to cool slightly before eating, or save for later. Beware: they will be very hot. 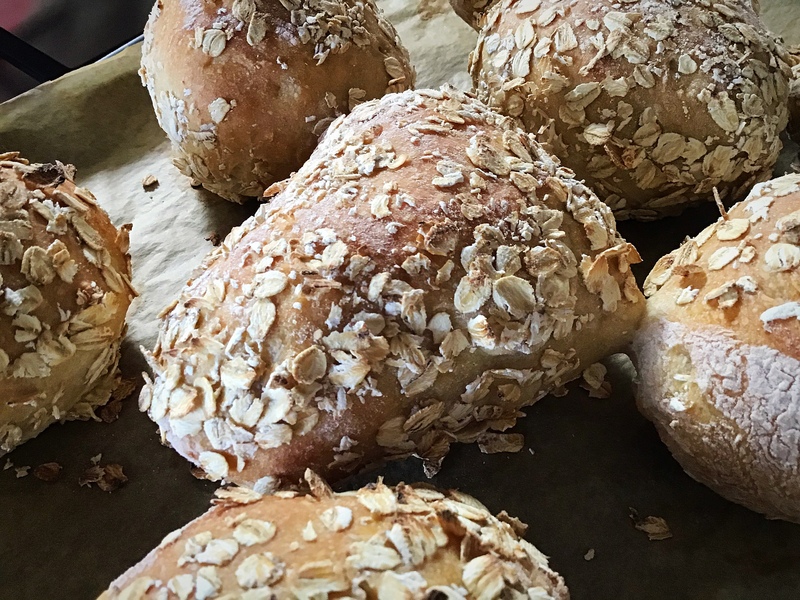 These rolls were made by just cutting up the dough, gently placing the sticky edges in some oats, then putting them onto the baking tray. Simple. Follow my master recipe up to and including the overnight prove. (Feel free to mix up the flour/flours you use in the dough, see the other recipes in my recipe index for various ideas). 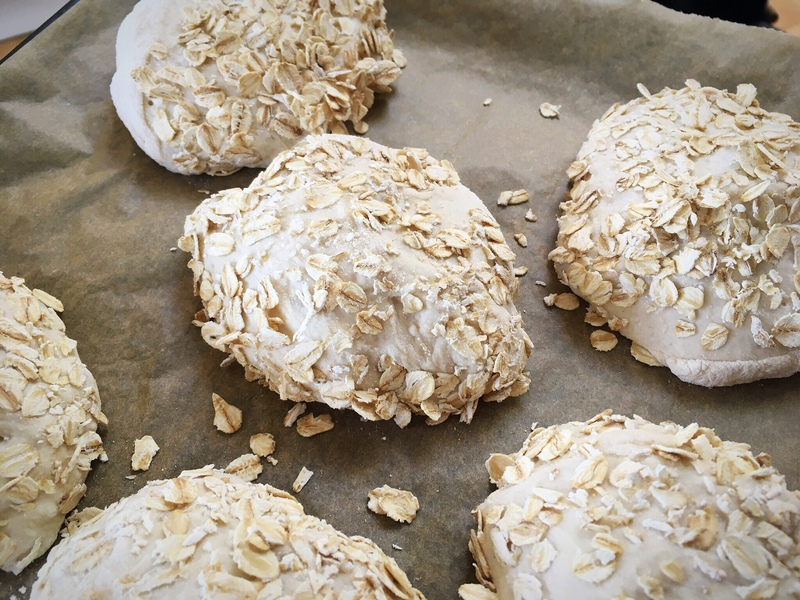 The next morning gently pull the dough into a loose ball and place it onto a floured surface. 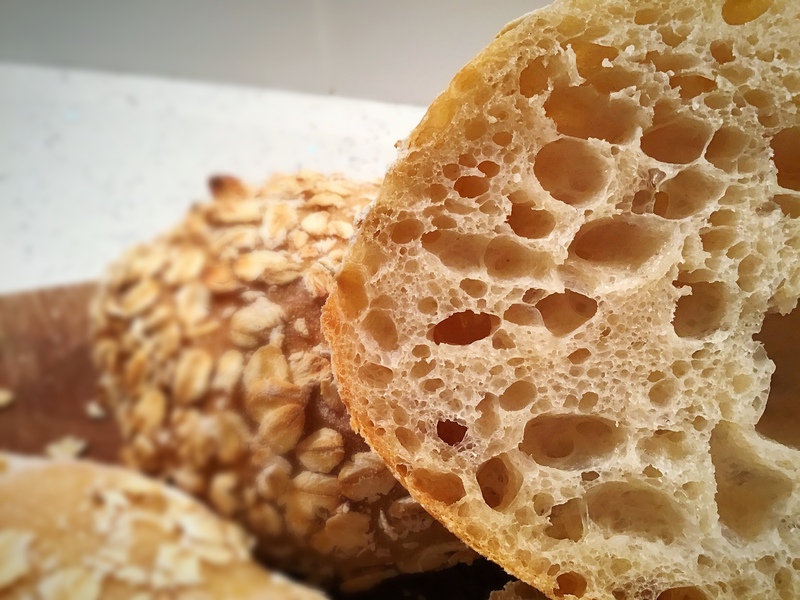 Using a dough knife or cutter, cut the dough into 8 equal-ish pieces. 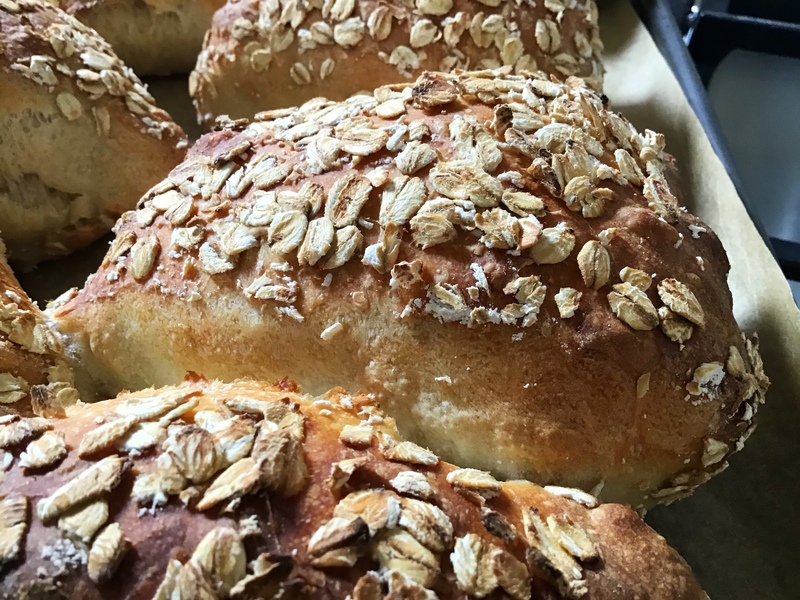 You’ll find that the edges that you’ve cut into are very sticky; you can now either place the cut shapes directly onto a parchment lined baking tray, or gently place the sticky edges in some oats or sesame seeds before placing onto the baking tray. You can now either bake them immediately, or after sitting for 10 minutes, or place the tray in the fridge for 1-3 hours then bake when you’re ready. 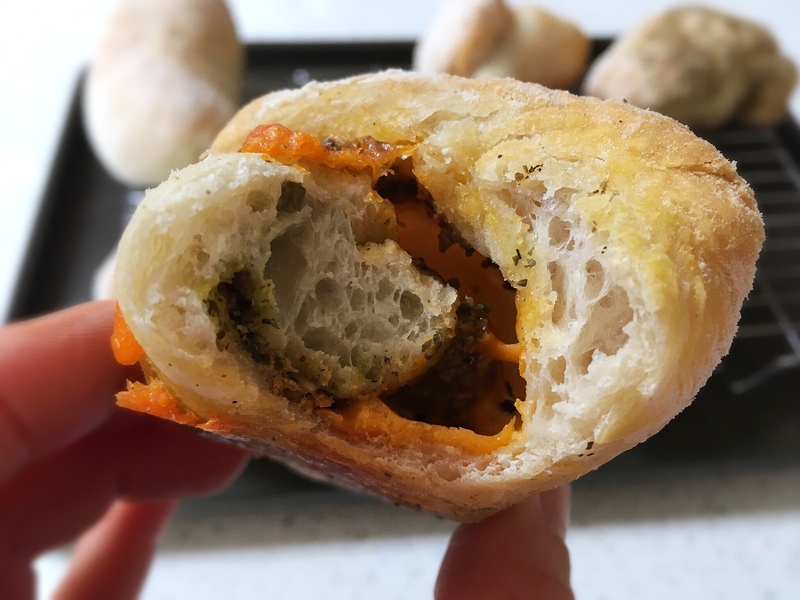 You can cook these from a cold start oven or in a preheated oven. Preheated oven: heat the oven to 200C fan assisted (220C non fan) and bake for 20 mins or until browned. Place on a rack to cool briefly, eat at will! 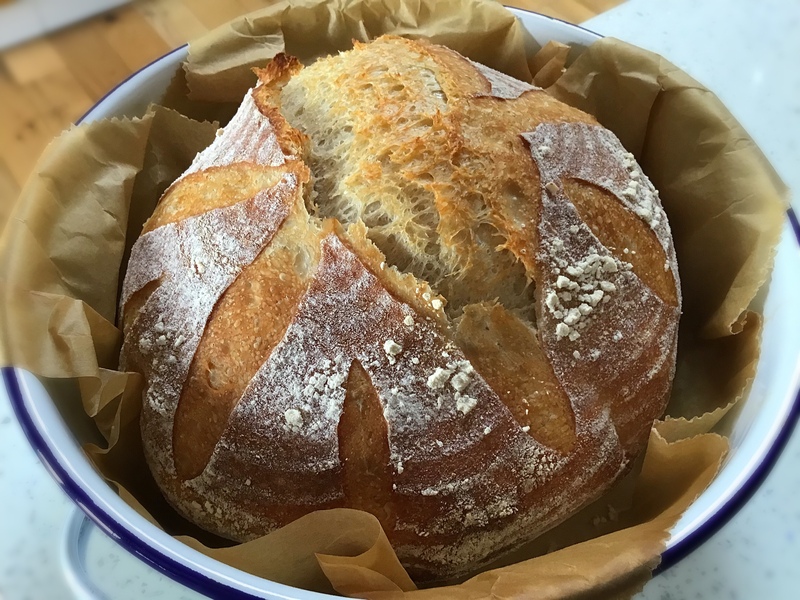 I’ve been making Sourdough for several months now using Elaine’s starter Star, but I fancied treating myself to a New Year break, and the chance to perfect my sourdough skills, so I booked myself in (with a friend) to one of her courses. It was lovely to finally meet Elaine after all our online conversations and her helpful tips helping me on my sourdough journey. 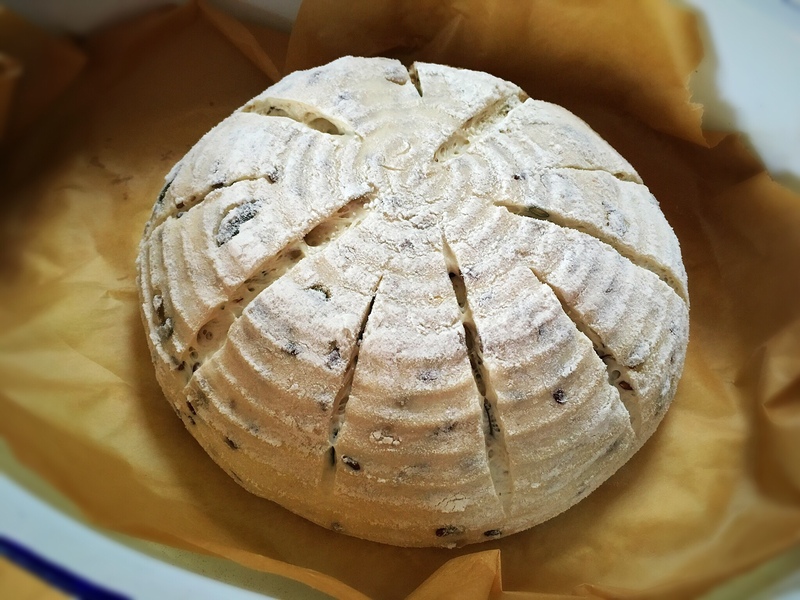 The course was wonderful, and I left full of inspiration and ideas to progress and improve with my sourdough baking. 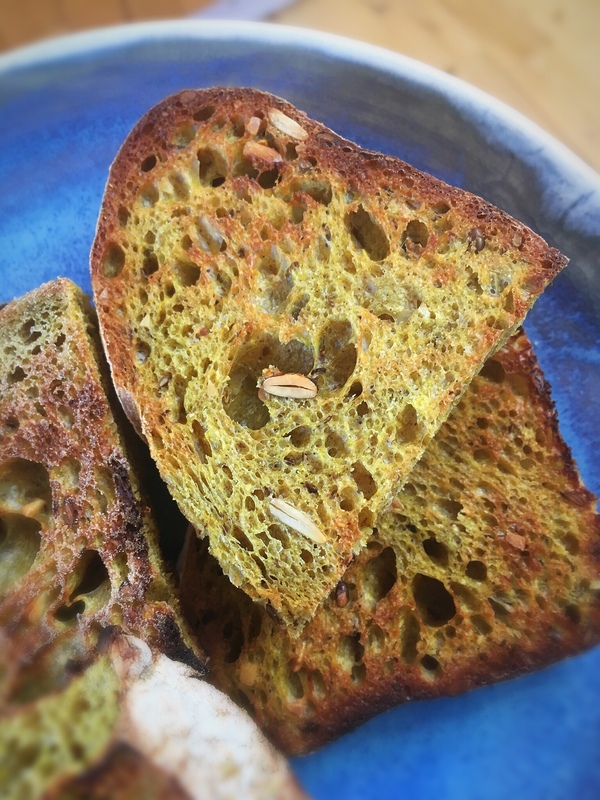 We were met with a cuppa and then Elaine explained about the different flours we would be using, from strong white bread flour to spelt, kamut, einkorn, rye and emmer. 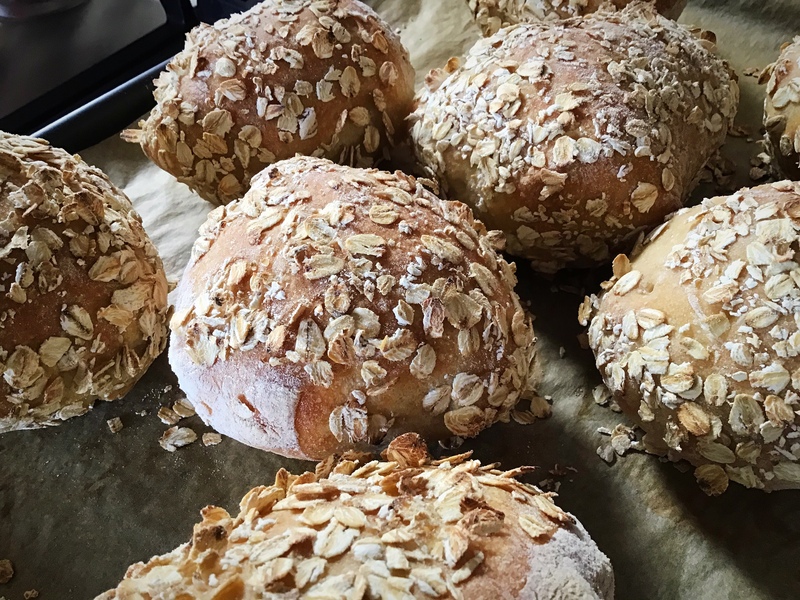 We made different shapes and sizes of bread loaves and bread buns, as well as preparing and baking with spice mixes, seeds and grains. Lunch is included in the course and Elaine treated us to some fabulous sourdough focaccia and an assortment of salads and dips. 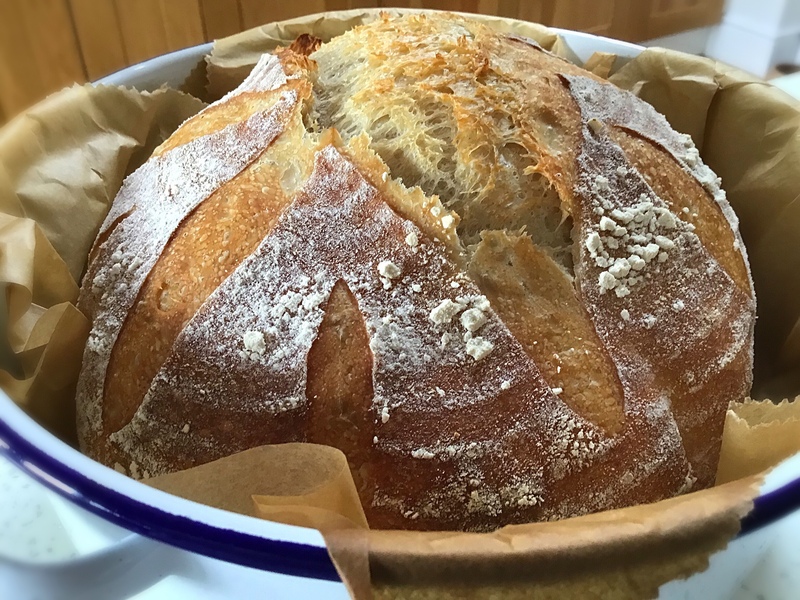 We finished the day after shaping and baking our own sourdough loaf, which we took home in a fabulous cotton bag with a packet of Elaine’s sourdough starter, the star! I learned so much and Elaine was informative without baffling us with science! 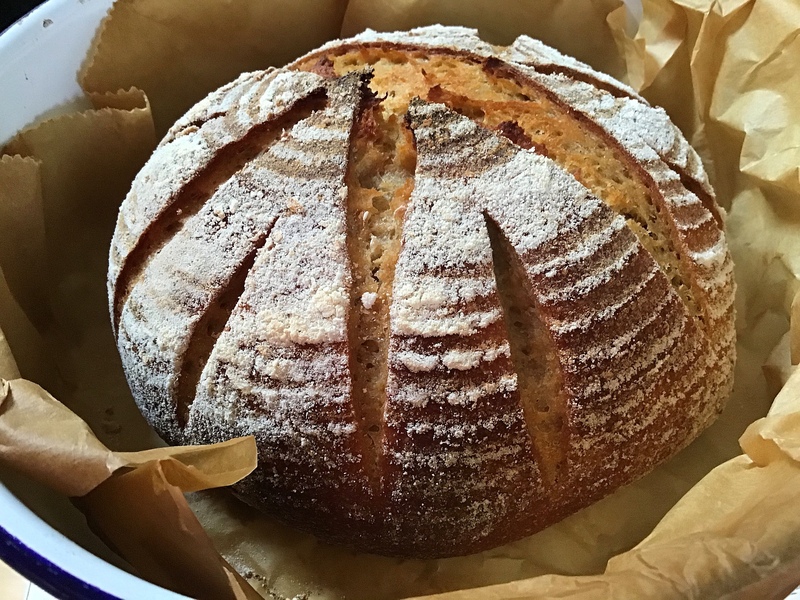 It’s not just Perfecting your Sourdough Skills but it’s simplifying sourdough too, with lots of hands on activity and the chance to make invaluable notes. Highly recommended and very reasonably priced. 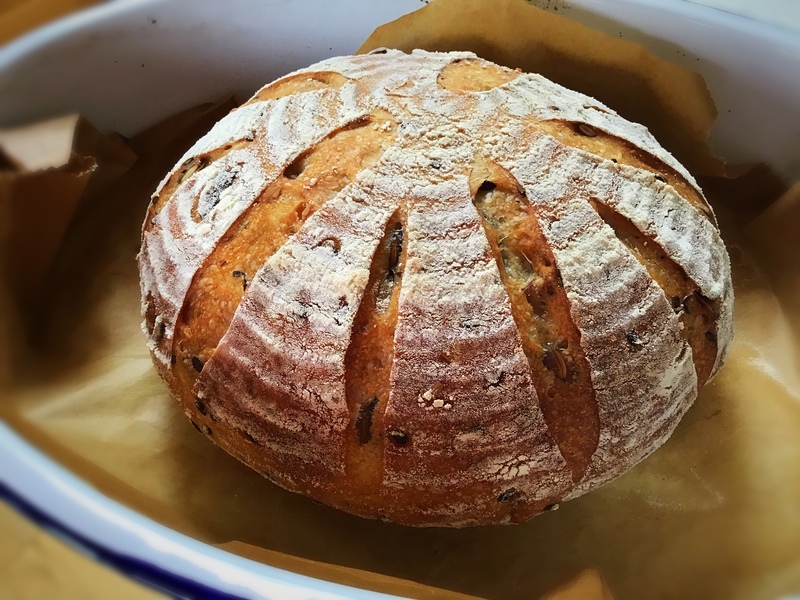 I think I can honestly say that I love this little loaf; the shape, the colour, and flavour, the texture…it was all lovely. 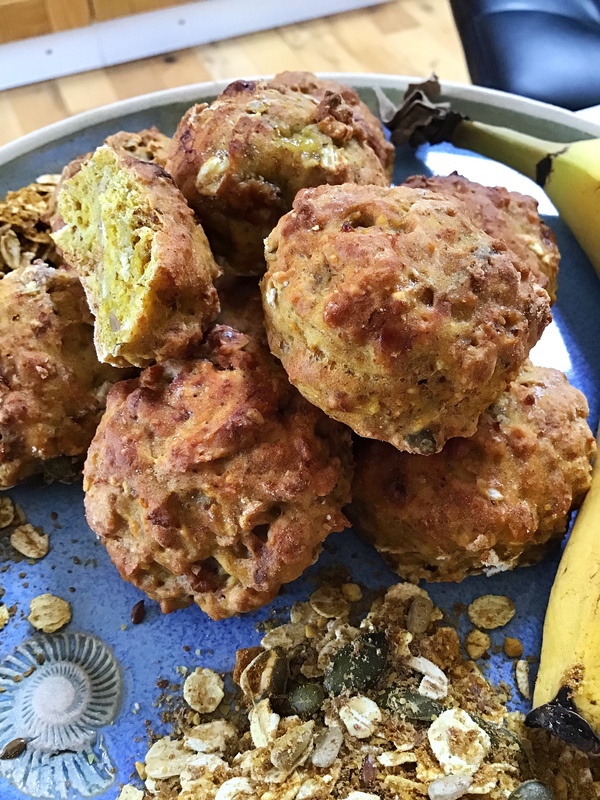 Let me explain…I make big batches of a ‘breakfast mix’ that I eat daily, as seen in the photo below, and I decided to throw some in with some dough and see how it went…and it went well! 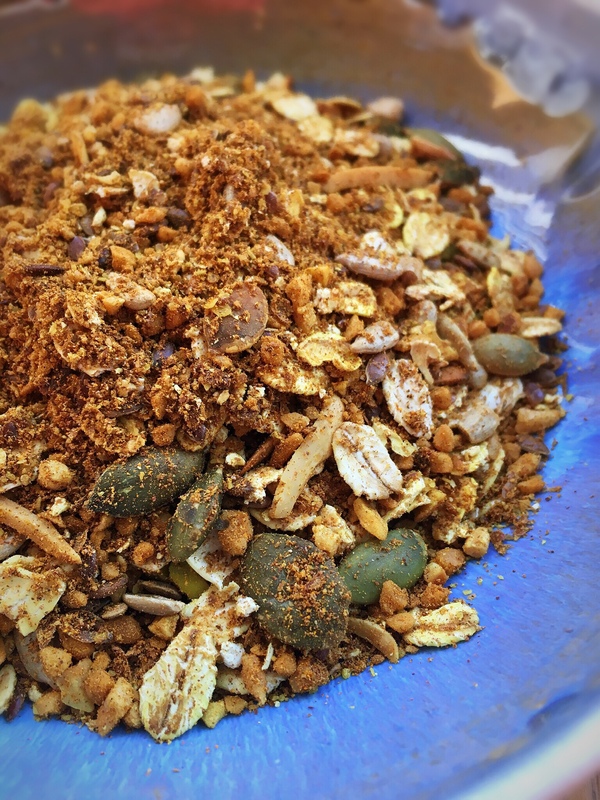 The mix is made up of oats, milled flaxseeds, toasted pumpkin seeds, sunflower seeds and linseeds, whatever chopped nuts I have in the cupboard, and lots of my chai inspired spice mix. The spice mix includes ground cinnamon, ginger, turmeric, cardamom, nutmeg, cloves and black pepper, the amounts descending in that order. I don’t measure it but as a rough guide I’d say that cinnamon makes up about 50% of the mix, the ginger and turmeric is probably 10-15% of each, and everything else decreases in quantity after that with the smallest amount being the ground black pepper which is only there to get the best out of consuming the turmeric. You can make it to suit your tastes. I soak 4 heaped tablespoons of this mix with water overnight, then mix it with mashed banana in the morning, heat and eat! And I love it, every single day I love it! 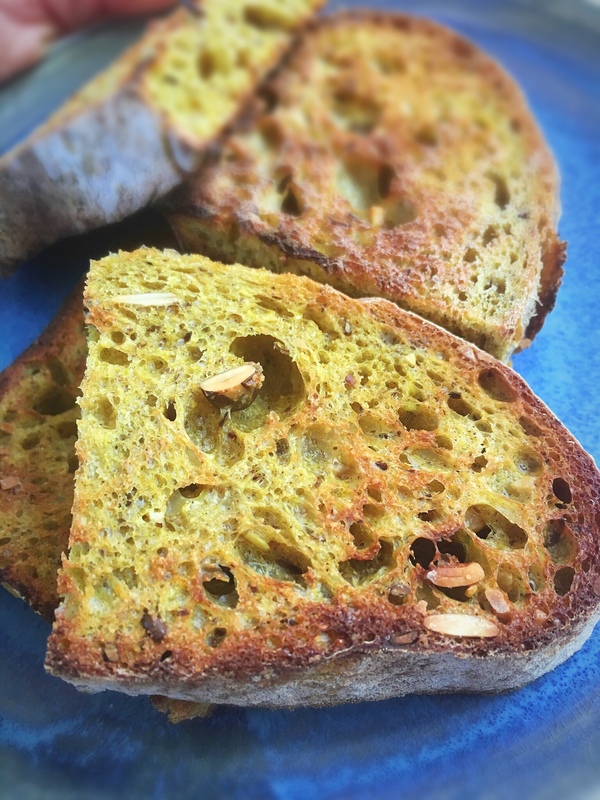 Anyway, back to the bread…you can now see that the colour comes from the spices, particularly the turmeric; with the inclusion of the oats and milled flaxseeds, it also adds some firmness to the dough, hence making it a delight to score.. 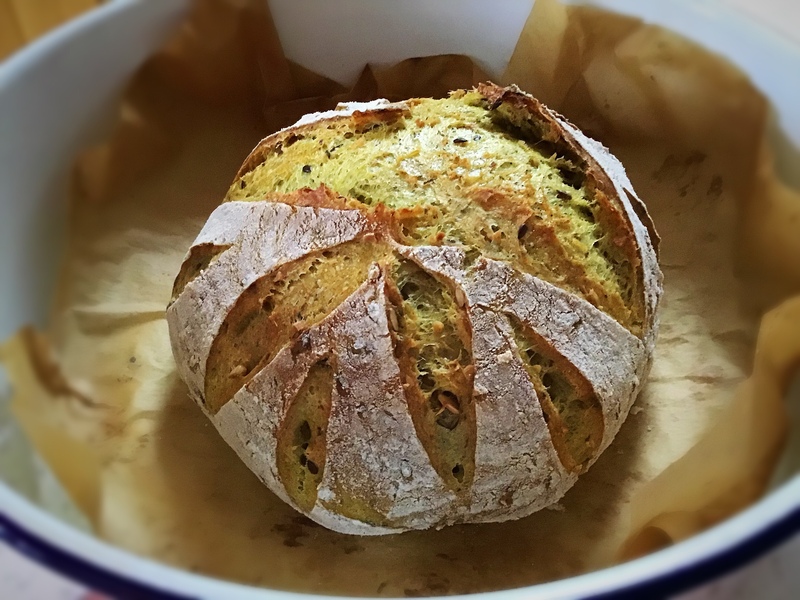 This was another little loaf using my 17cm diameter banneton, which is working perfectly for such experiments. The loaf smelled amazing whilst and once baked, and tasted good fresh, the smelled amazing again when toasted! 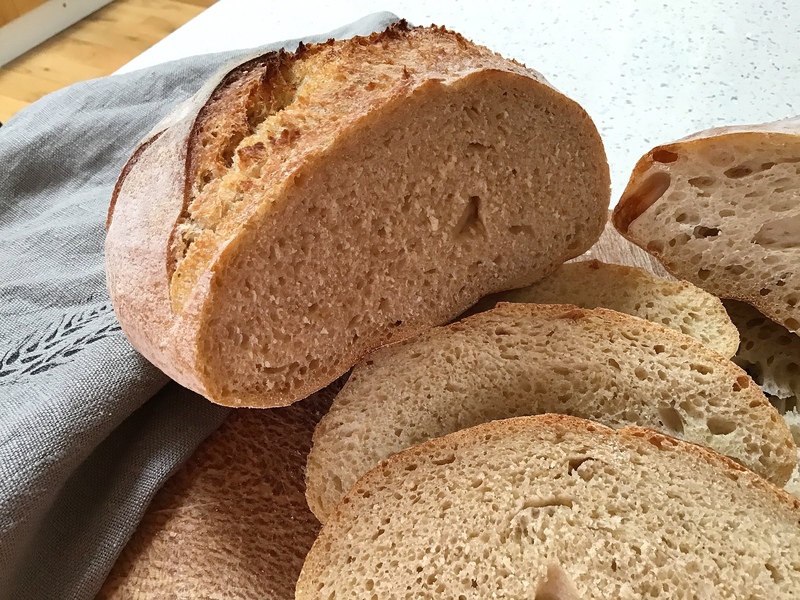 To make this lovely loaf, I used the process of my master recipe, link to the left, with the quantities below, feel free to scale it up at will. 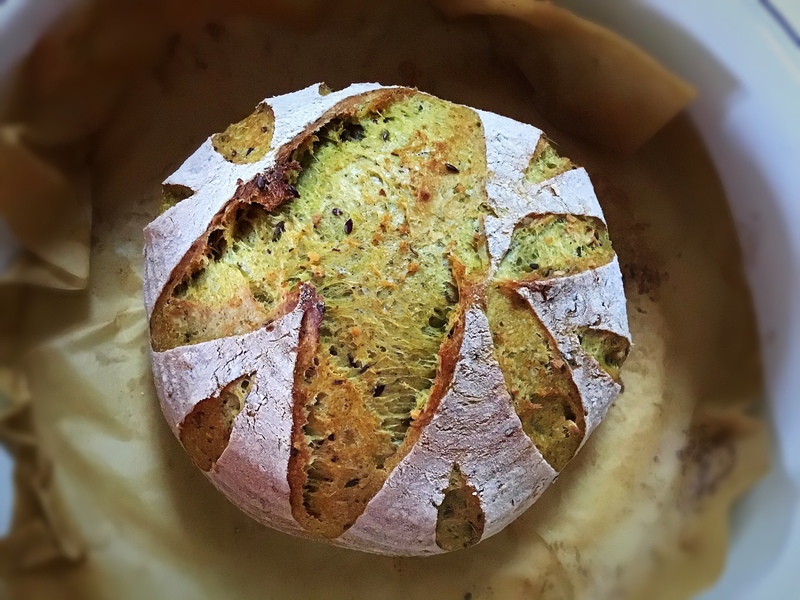 I baked it at 220C fan (240C non fan) for 30-35 mins. 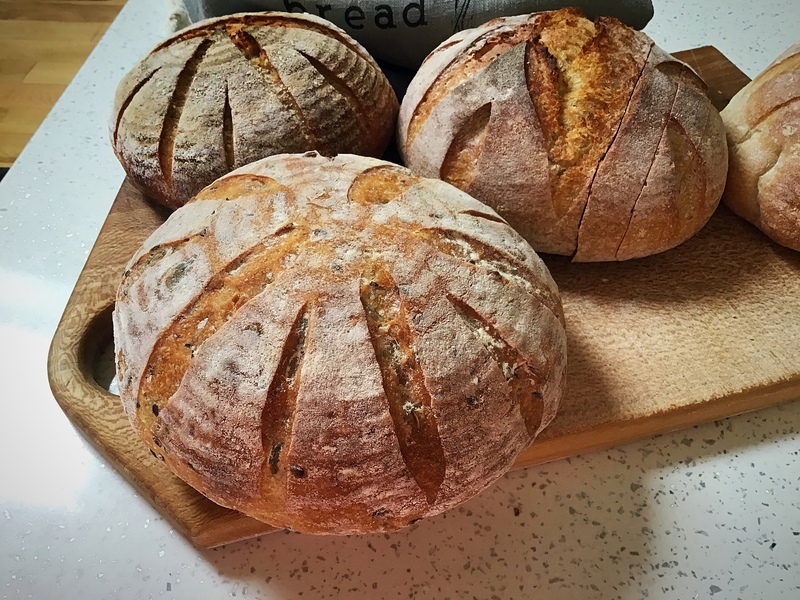 These loaves have been made using my starter and a variety of white spelt flour, kamut/khorason flour, and mixes of the two. 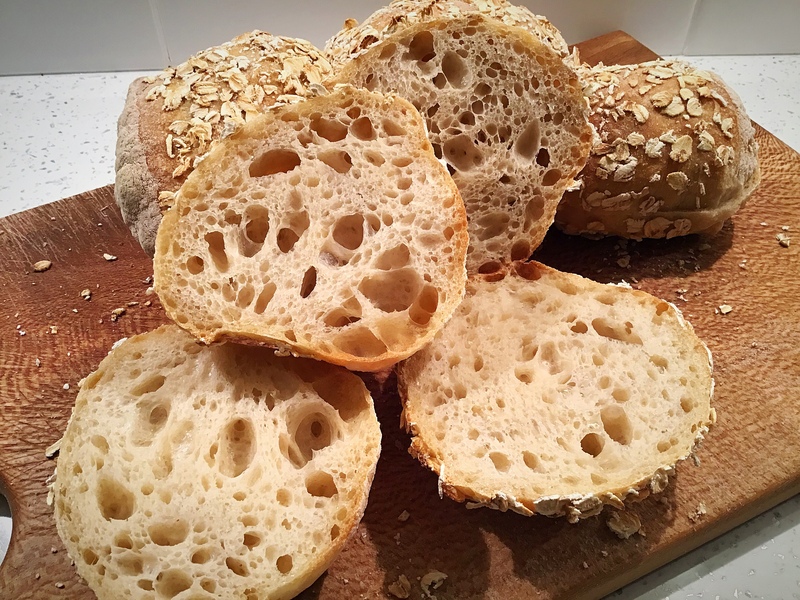 These were experimental to test how the flours would hold up on their own for use in sourdough so this post is to share the outcome. 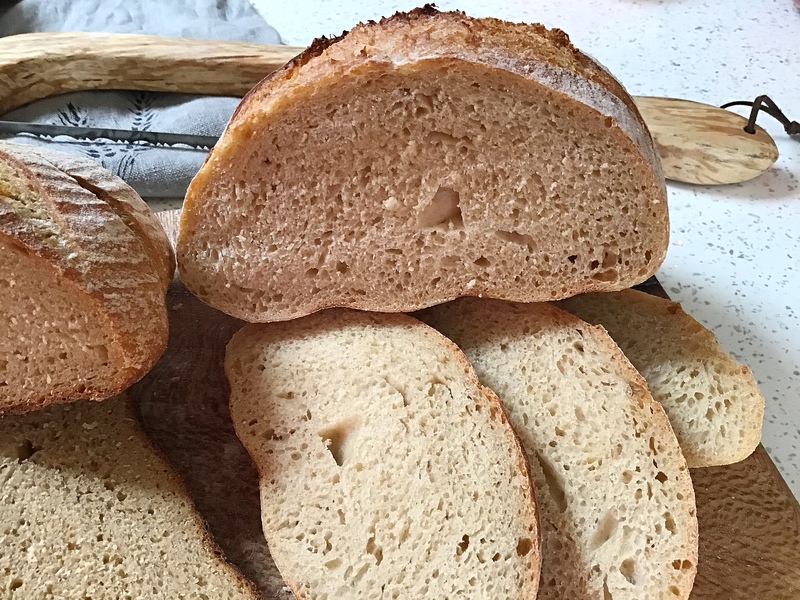 I’ve used both spelt and kamut flour in loaves that included strong white bread flour with great success and flavour, which you can find in my recipe index; this time I wanted to test them out on their own to see how they behaved. 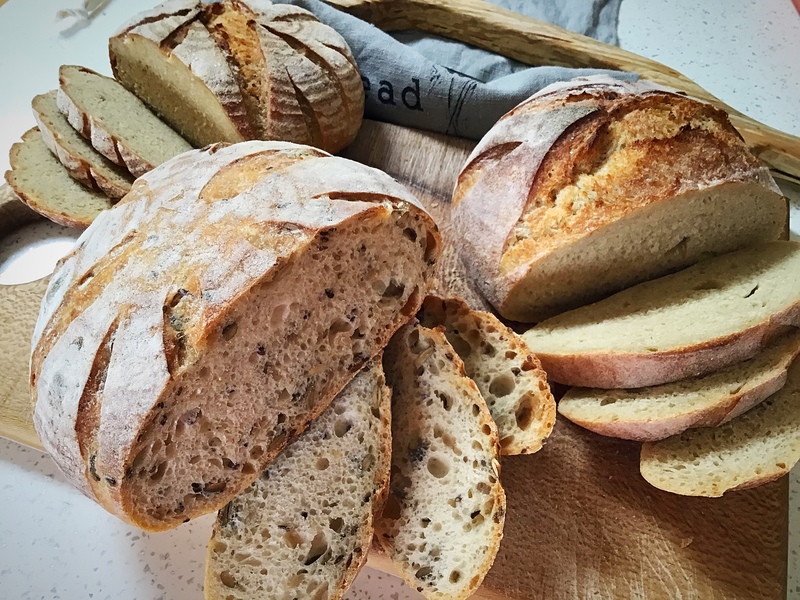 Please note: these loaves were all made with a smaller banneton which is 17cm diameter and 7.5cm deep. This allowed me to use less flour in these trials. The quantities are included at the end of the post. 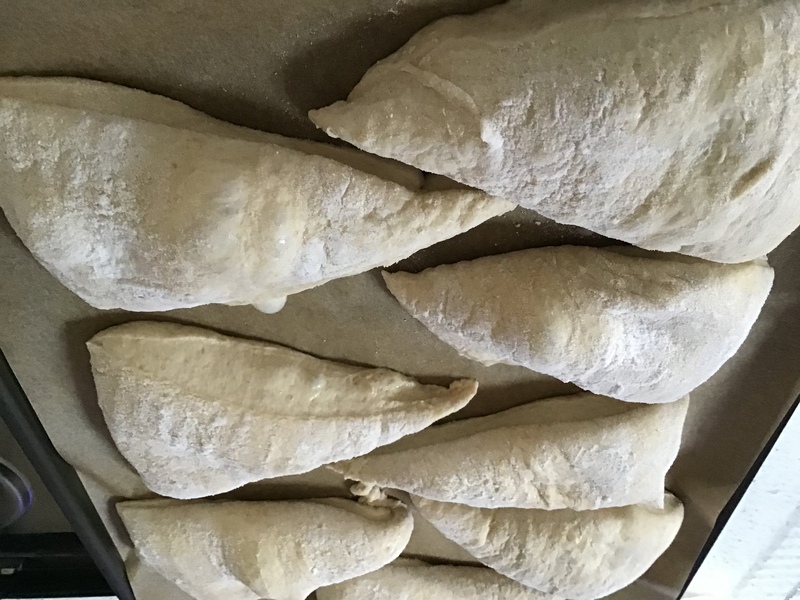 And: I’ve used my same starter in all of them, fed the usual way with strong white bread flour; you don’t need different starters for different loaves. Firstly, let me talk about the actual flours themselves; these are milled from ancients grains. 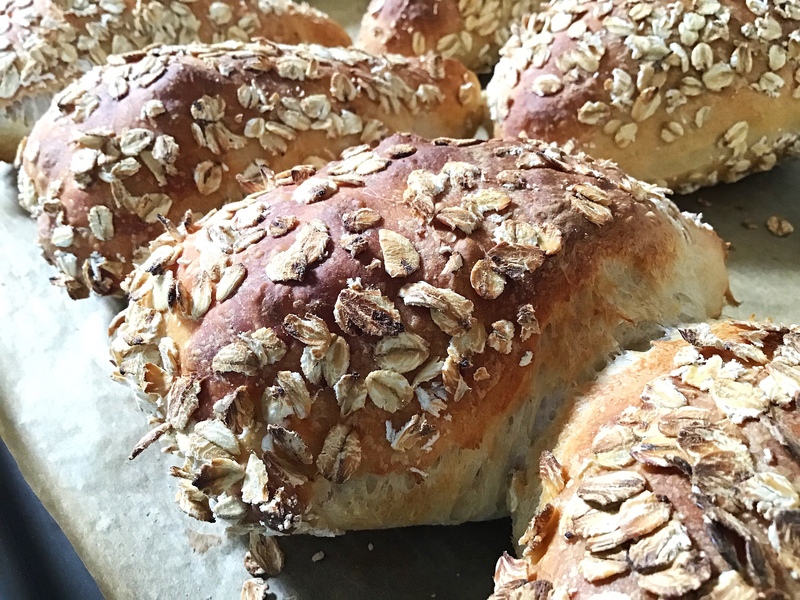 Spelt and khorason (kamut is actually the brand name, the entire grain has a brand!) 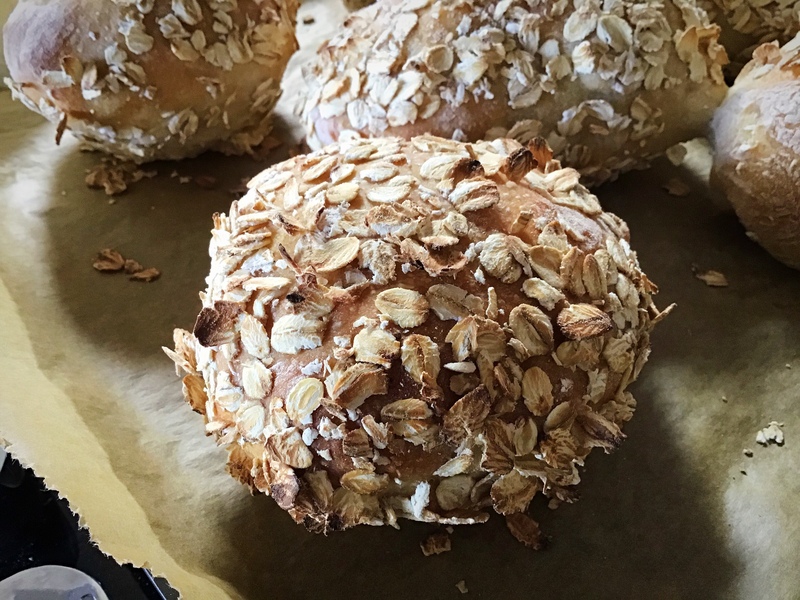 are wonderfully tasty grains that are lovely and nutty and chewy to eat in their naturally grown form once cooked, I eat them a lot this way. The flours are milled from those grains. 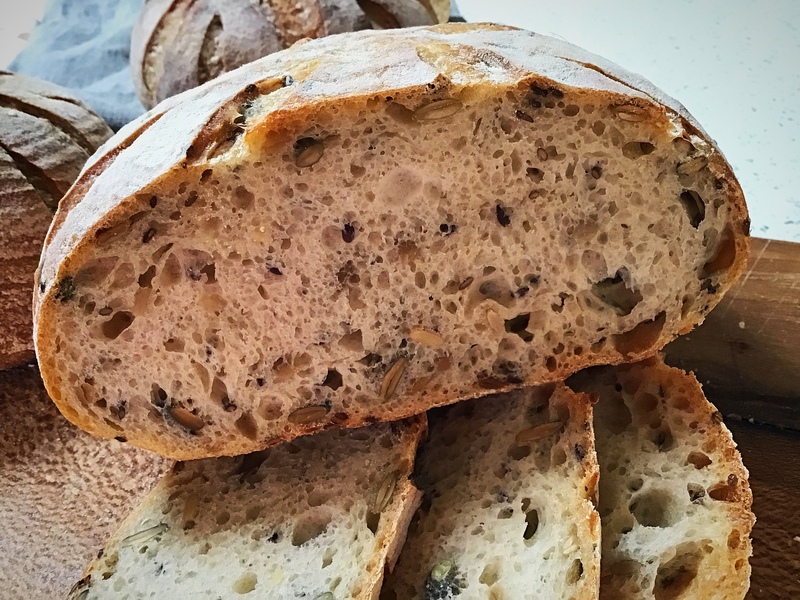 Being ancient grains, they are quite different from more modern flours, and very different from one another, so considerations have to be taken when using them in your sourdough. 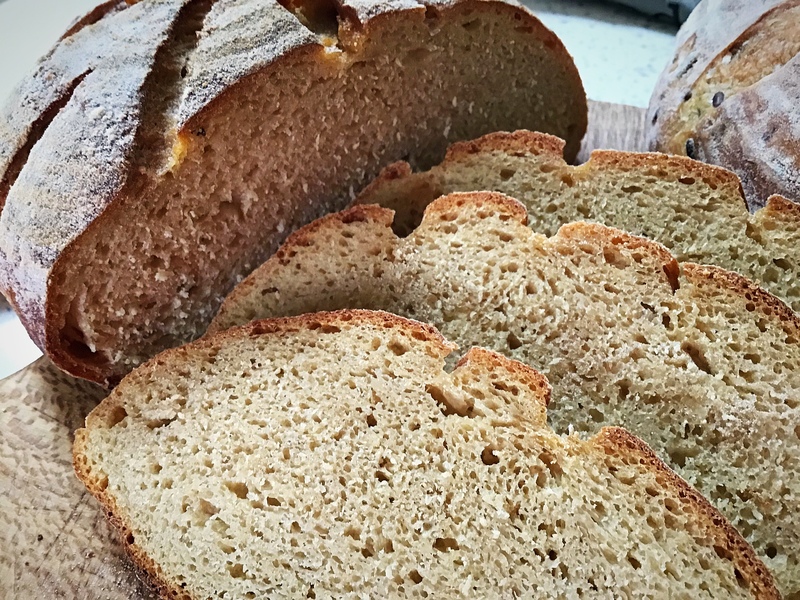 White spelt flour is very soft, it’s a lovely fine gentle flour. 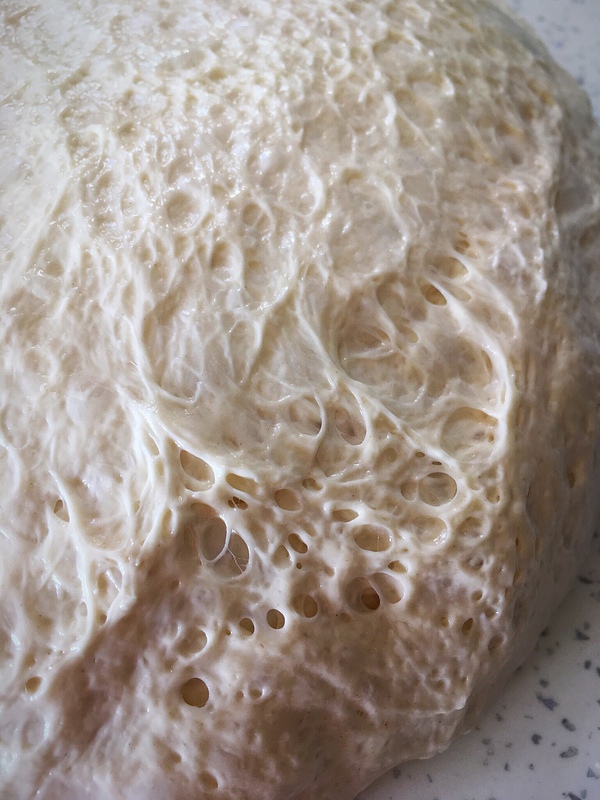 It therefore struggles to hold its form if used 100% for a free form loaf such as sourdough because it is not a very strong flour, the protein level is less than 11%, and so it benefits from additions to give it strength to hold its shape. 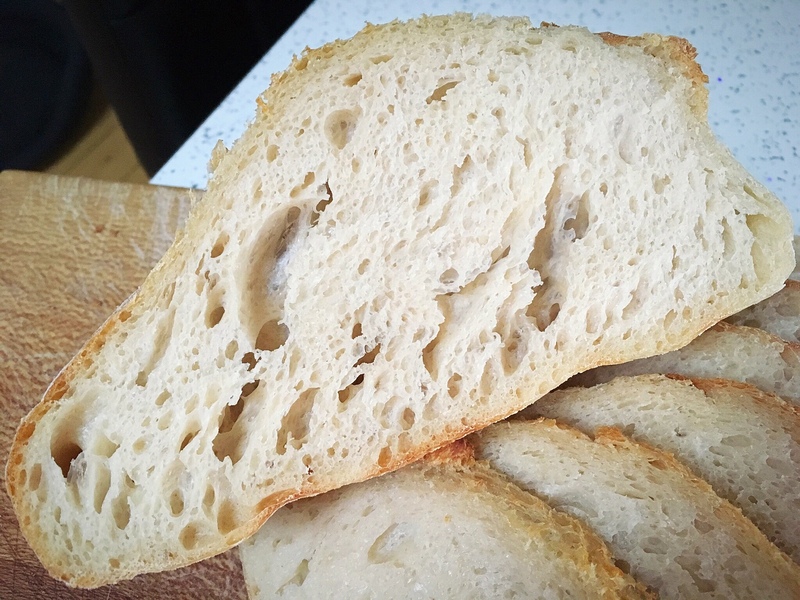 I found that when used on it’s own for a loaf, it still created a lovely dough, it rose well, it baked nicely, the crumb was lovely and light, but it was a bit unevenly shaped once baked. 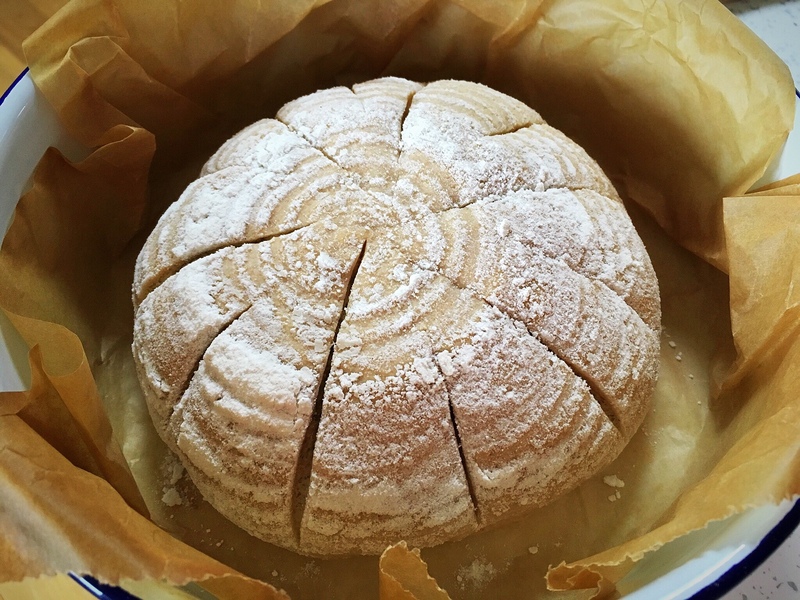 I know from past experience that spelt does not hold its shape so I chose to bake it in a smaller pan (20cm diameter as opposed to me usual 26cm diameter enamel roaster) to give it the benefit of the sides of the pan to stop it from spreading, which it needed. The cut slice shows the shape more. 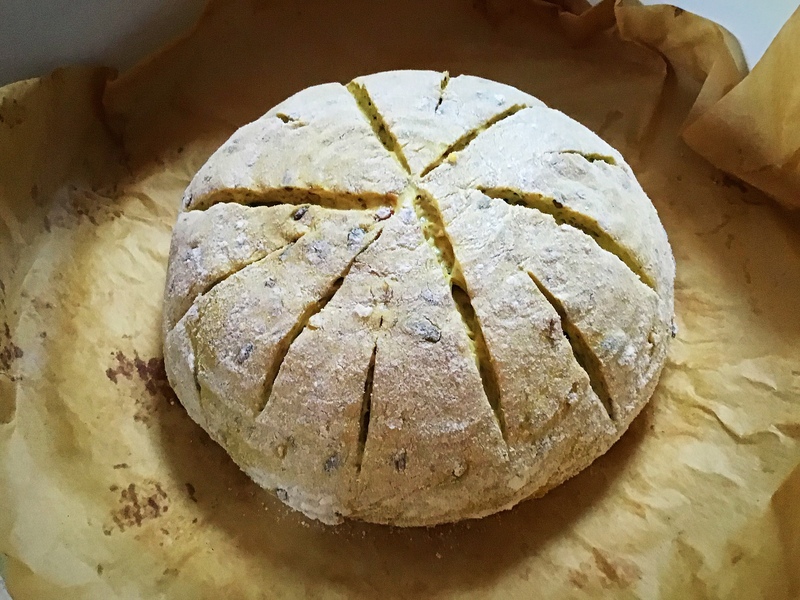 Once I added seeds to the dough, it was a whole different story: they gave the dough structure and it held its shape perfectly, hence being able to use a bigger pan. And it tasted great!!!!! 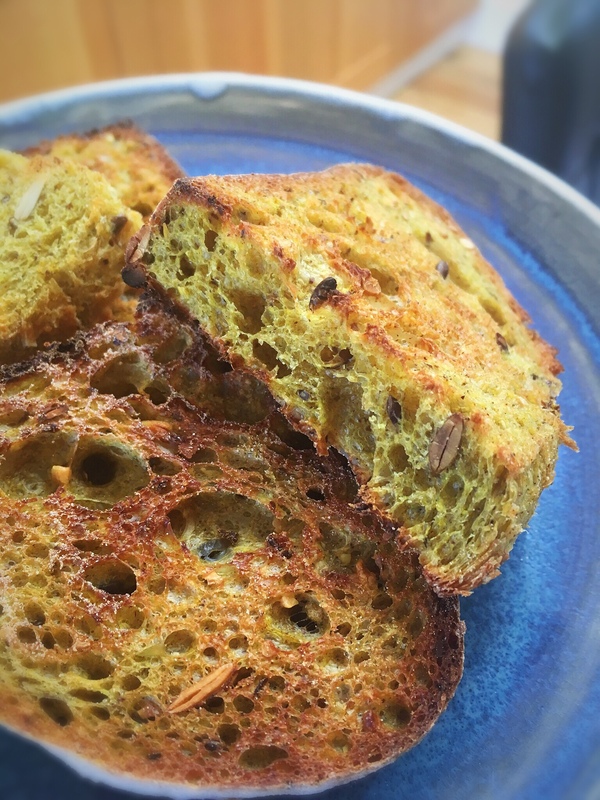 I always toast my seeds beforehand which all adds to the flavour. Khorason flour is quite different. 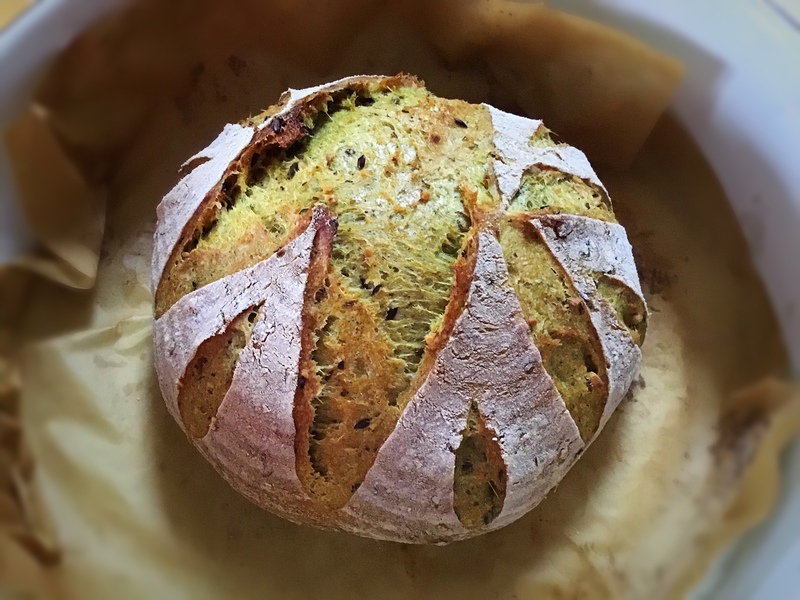 I used a wholewheat khorason flour which has 15g of protein per 100g. The flour is a lot more grainy that the spelt, and it soaks up a lot more water. 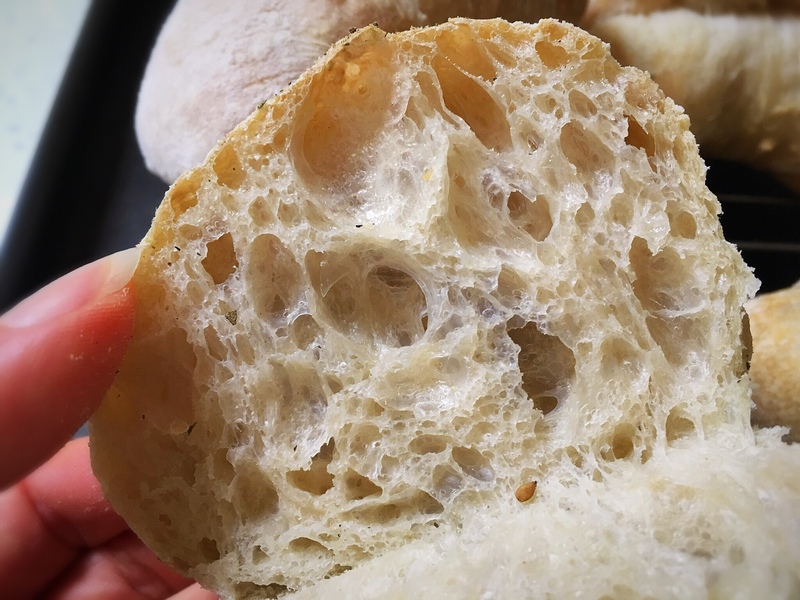 It can often pull in quite tightly when first mixed into a dough, then loosen up later, so don’t be fooled! 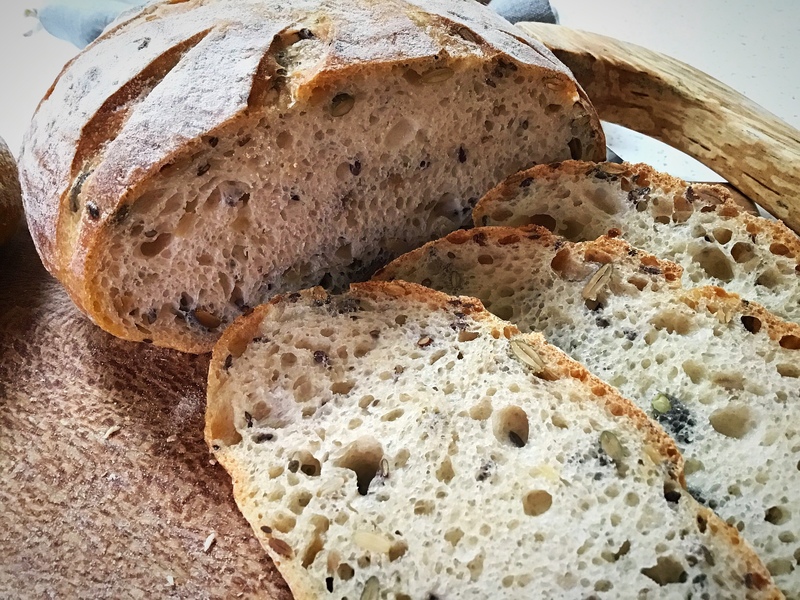 I have found that it enhances the flavour of the sourdough quite distinctly and increases the sourness. 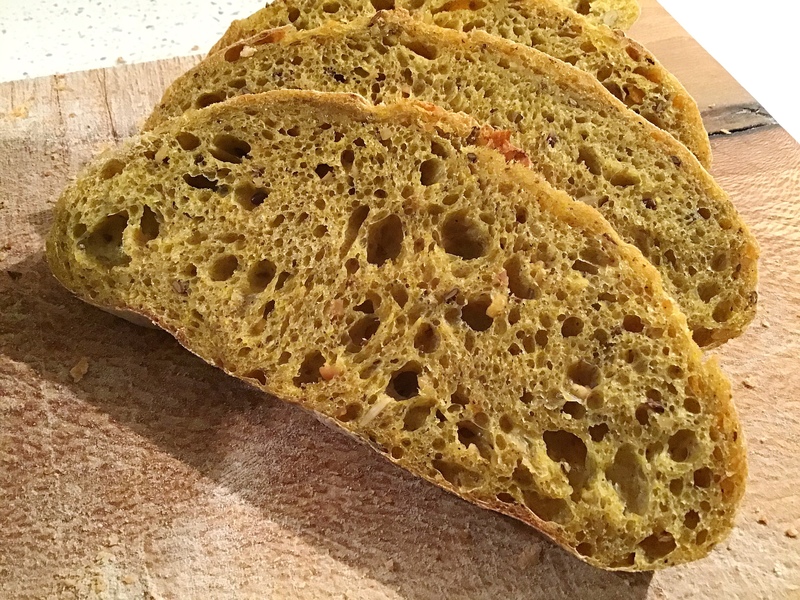 Using it for a 100% khorason loaf generates a tight crumb and a denser bake, but it’s so tasty, I recommend trying it. Mixing 50:50 white spelt flour and wholewheat khorason was a real success: the spelt lifts and lightens the khorason, whilst the khorason gives the spelt structure. And it tastes great! 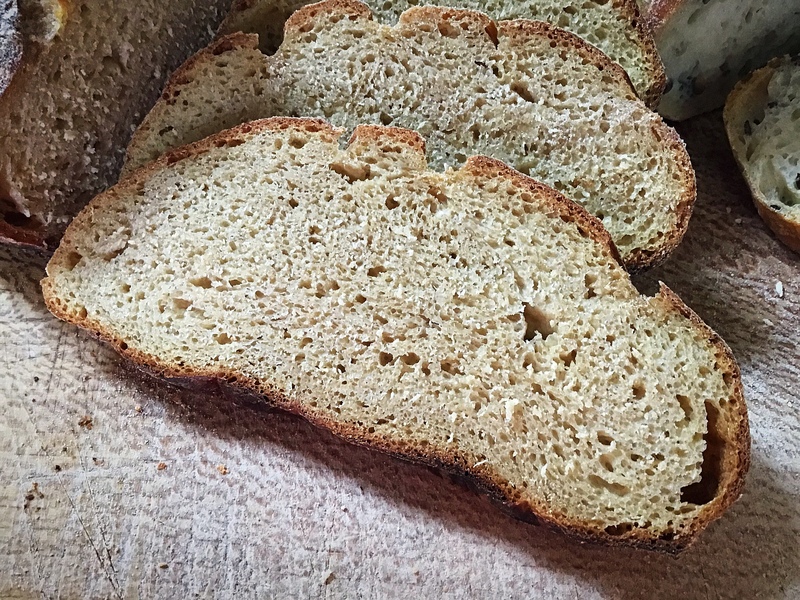 it’s still a closer crumb than all white or all spelt, but it’s tasty and lovely which is all that matters right? And the butter doesn’t escape! 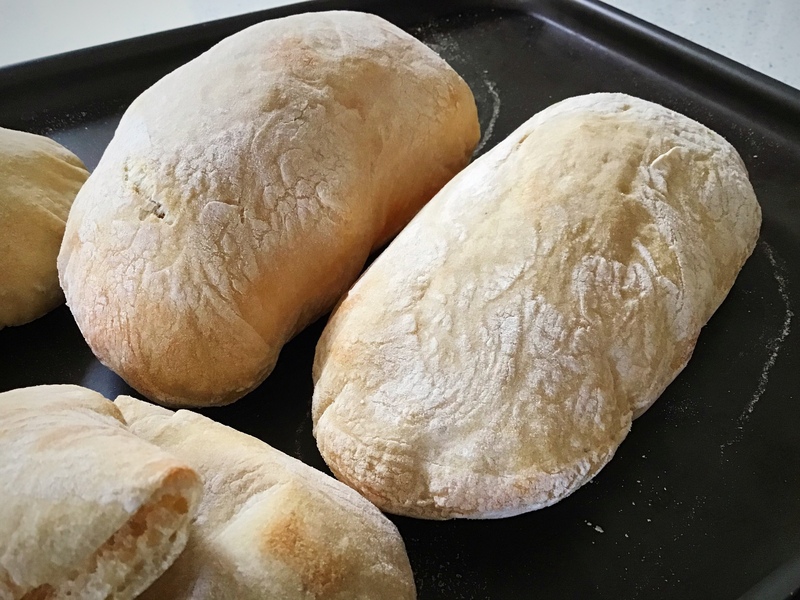 I will be putting videos of making these loaves on YouTube, but all I’ve done is use my master recipe process, all I’ve done is change the quantities, so everything else is the same; please feel free to increase the quantities to make a bigger loaf. 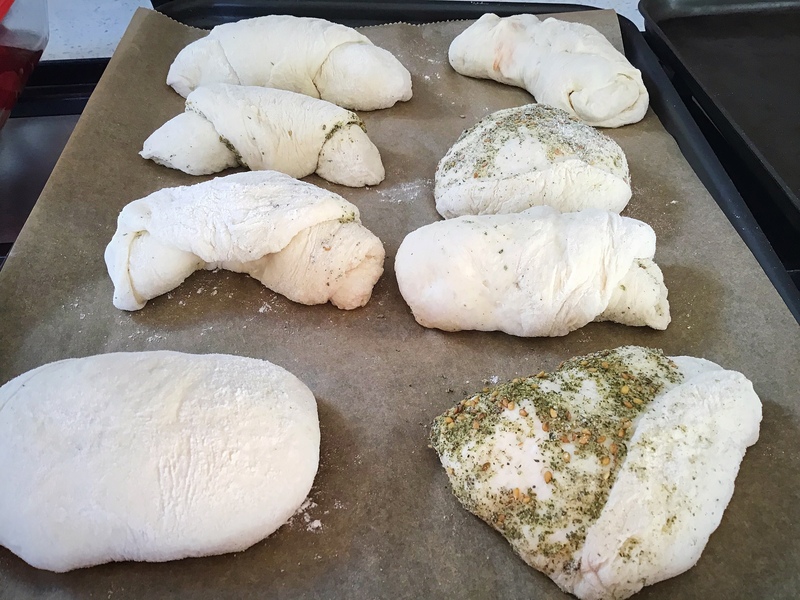 The process: I used the process of my master recipe, find the links to the left, all the way through, and baked in a preheated oven at 220C fan (240C non fan) covered, for 30-35 minutes as required. The starter was always fed and bubbly!